I flew to London a few days ago to see Goya: The Portraits at the National Gallery. The exhibition is on in the Sainsbury Wing until 10th January and if you like art and have the time I would urge you to go. Even with the bad Pound/Euro exchange rate it’s worth the trip: Ryanair flights are cheap and you get some time in a wonderful city. I love London and I try to get there a few times a year. Ah, you say, I like Goya, but I have a book of his paintings, or, I can look them up online – why bother with the hassle and expense of going all the way to the National Gallery? Look, here’s a few of the pictures on my high-res smartphone. That’s like listening to a Mozart symphony on a tinny little radio in comparison to sitting in a concert hall at a live orchestral performance and letting the sound overwhelm you. Standing in front of an original artwork is a wholly different experience to casually flipping through the pages of a book or looking at images on the internet. Here, you are within inches of the surface of a painting made more than 200 years ago by an artist of genius. You can see detail that no photograph can ever replicate. The sizes of some of the paintings can astonish you and this is something that reproductions can never prepare you for (unless, maybe, you carefully note the sizes quoted in books and websites and can imagine them in reality – I don’t and can’t). Then there’s the ritual of descending the stairs in the Sainsbury Wing, showing your ticket to the attendant, entering the low lit area of the exhibition (ambient light levels are kept low to protect the works but they are well illuminated), and going from room to room to view all the 71 exhibits. You emerge feeling exhilarated from the privilege of being in the presence of genius, from the sheer magnificence of the works on display. Here are some screenshots from various websites of a few of the paintings. 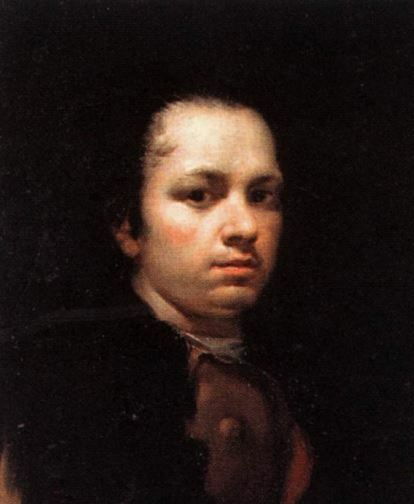 A Self Portrait circa 1780. 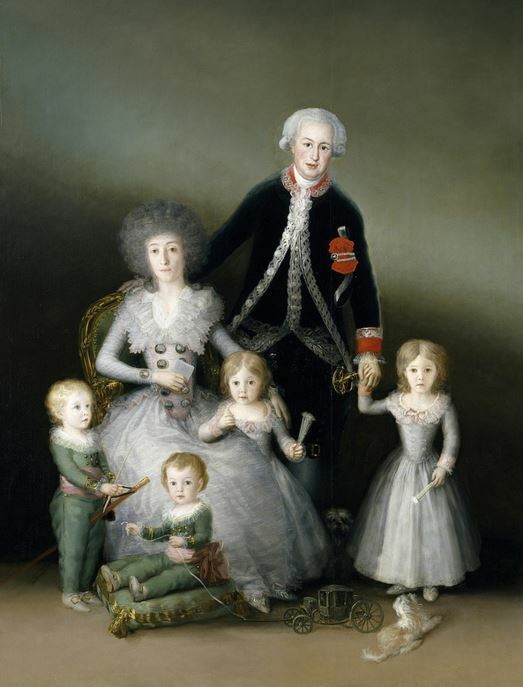 The Duke and Duchess of Osuna and their Children, 1788. The Dowager Marchioness of Villafranca, 1796. The Countess Duchess of Benavente, 1785. 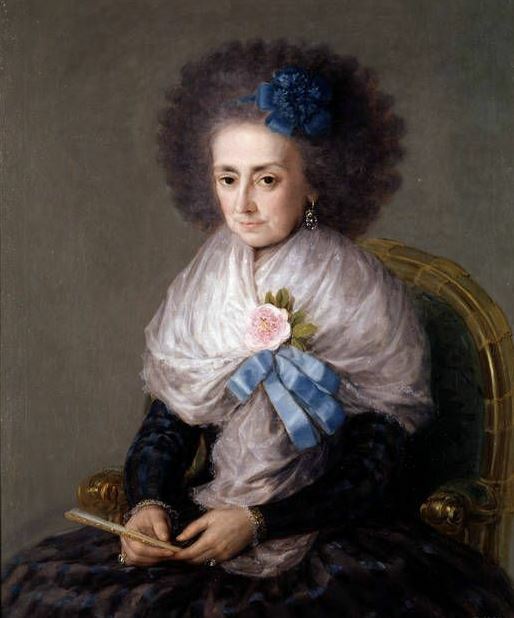 She was one of Goya’s greatest patrons and was a very forward thinking person. She and her husband commissioned works satirising Church corruption and the backwardness of Spanish society. 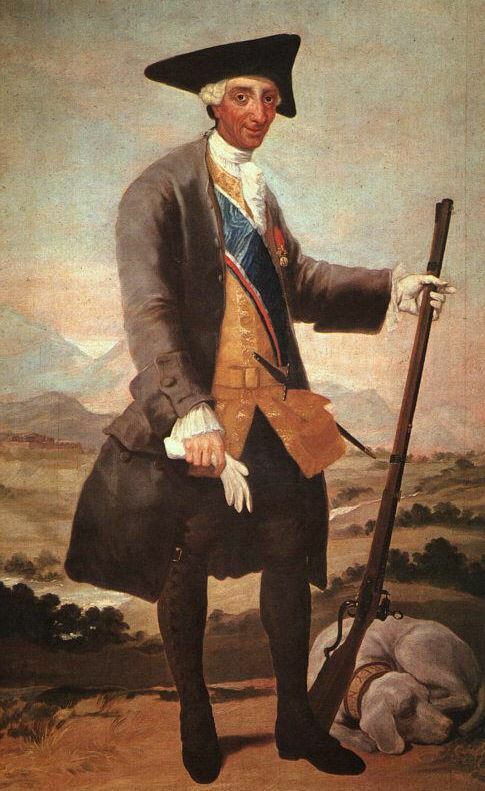 Charles 111 in Hunting Dress, 1786-8. Charles 111 was “famously and unashamedly ugly”, as the catalogue puts it. 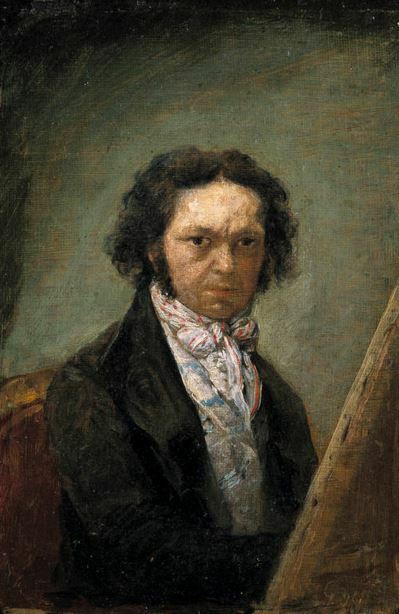 This gives some idea of what it must have felt like to sit for Goya, to be the object of that penetrating stare. The Marchioness of Santa Cruz, 1805. Part of a trend in Europe at the time of depicting young women as classical personifications. 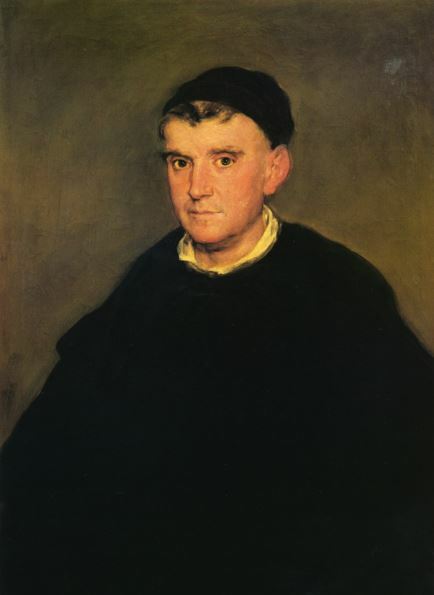 Friar Juan Fernández de Rojas, circa 1800. The friar was an intellectual who espoused modern theology. The sheer intelligence of the man is apparent in this superb portrait. 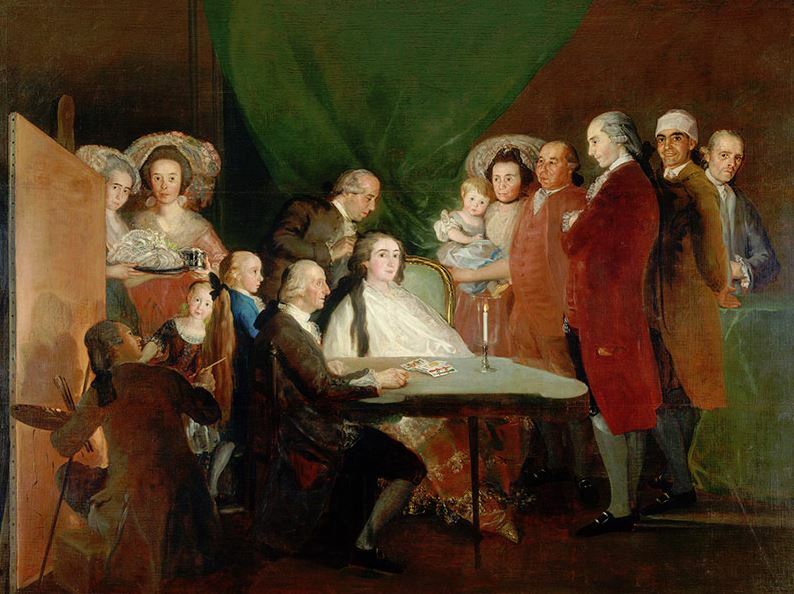 The Family of the Infante Don Luis de Borbón, 1783. 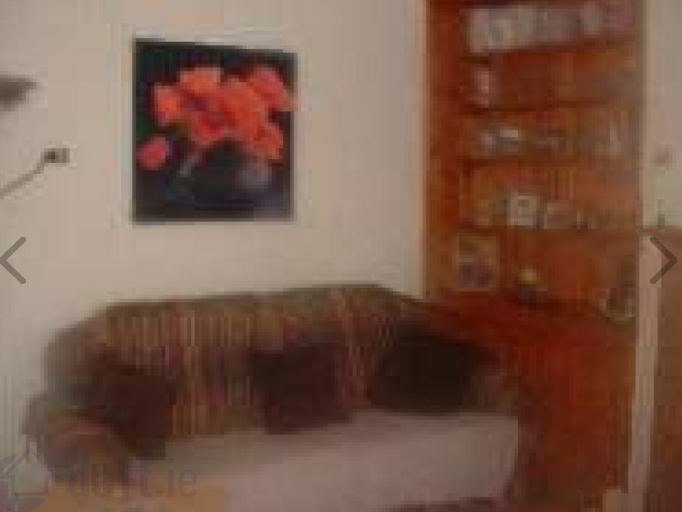 Goya has included himself on the left and the painting is a nod to Velázquez’s “Las Meninas”. A strange but beautiful painting. 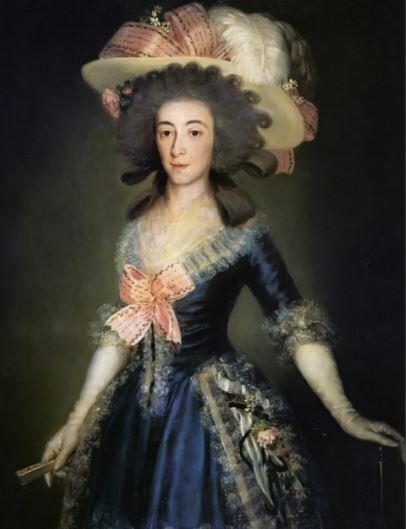 The Duchess of Alba, 1797. 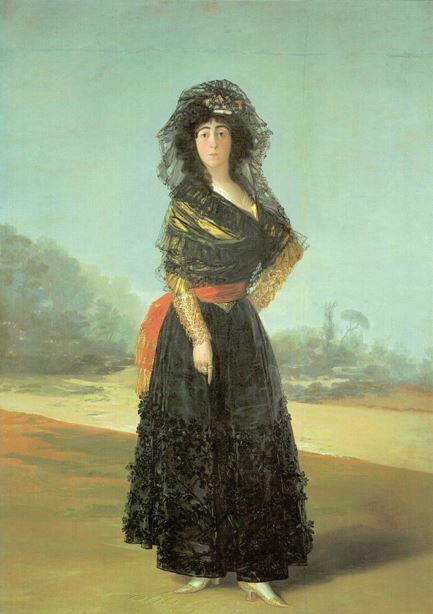 A huge painting, this depicts the highest-ranking woman in Spain after the queen. A widow with a fiery temper she is pointing to an inscription on the sand which says “Sola Goya” (“Only Goya”). 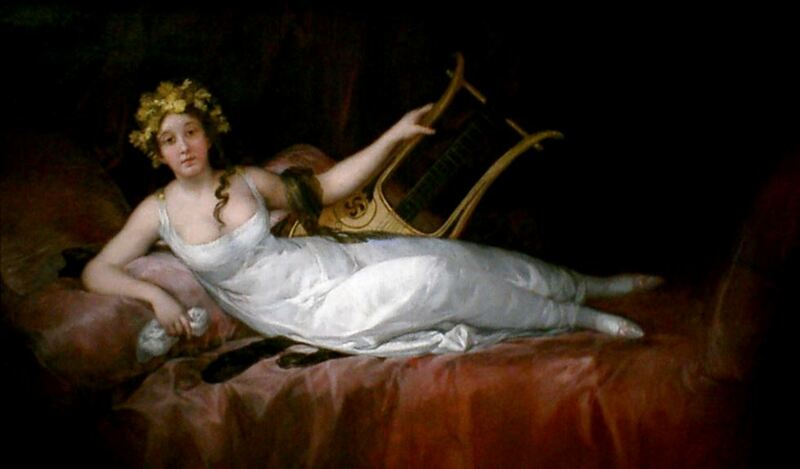 This was once thought to mean that she and Goya were lovers but scholarly opinion now suggests that it is instead a reference by Goya to his supremacy as a painter. To which I say to the scholars – “yeah, right”. The above reproductions only give the merest idea of what the originals are like. I repeat: seeing them in reality is a different experience altogether. So, if you can, go. I eventually got around to heading to North Donegal a couple of days ago. It’s a long journey from the deep south. I had to drop my son off in Galway on the way and the traffic congestion there caused by the annual race meeting added to the total journey time of 8 hours (including a stop for lunch). 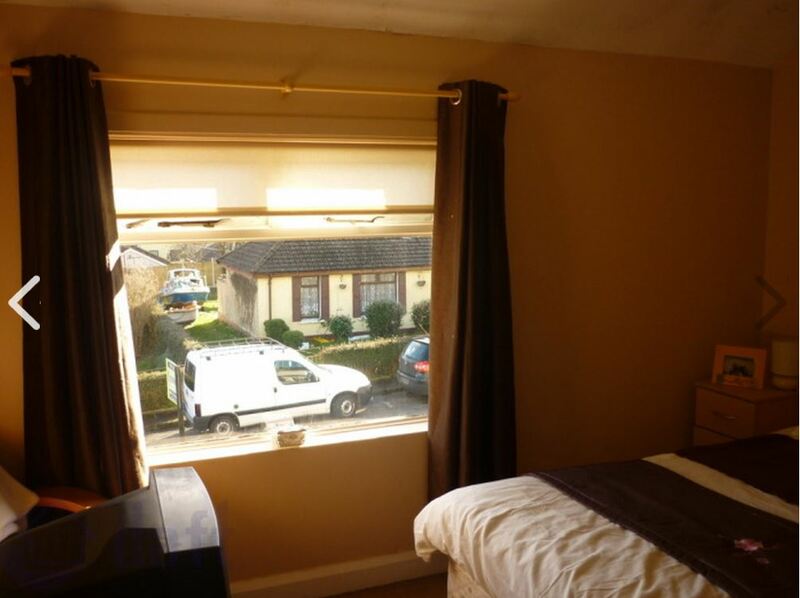 I stayed in the little town of Downings, 20 minutes from Fanad, at Downings Bay Hotel where an excellent double room cost me €65 including breakfast. 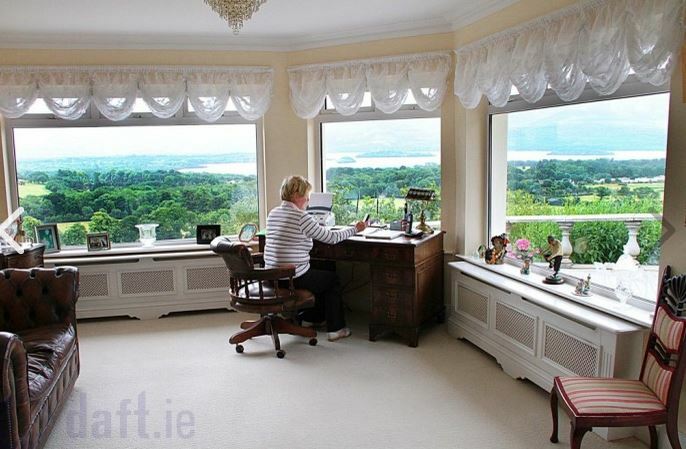 (My thanks to Cork photographer John Hall for the accommodation recommendation.) 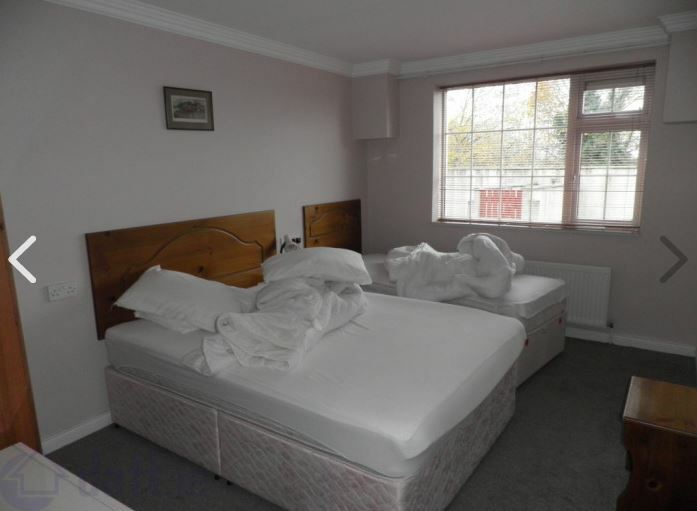 I had assumed there would be plenty of B&Bs in the general vicinity but that is not so. Either of the two hotels in Downings would appear to be the best option for anyone thinking of going there and staying overnight. 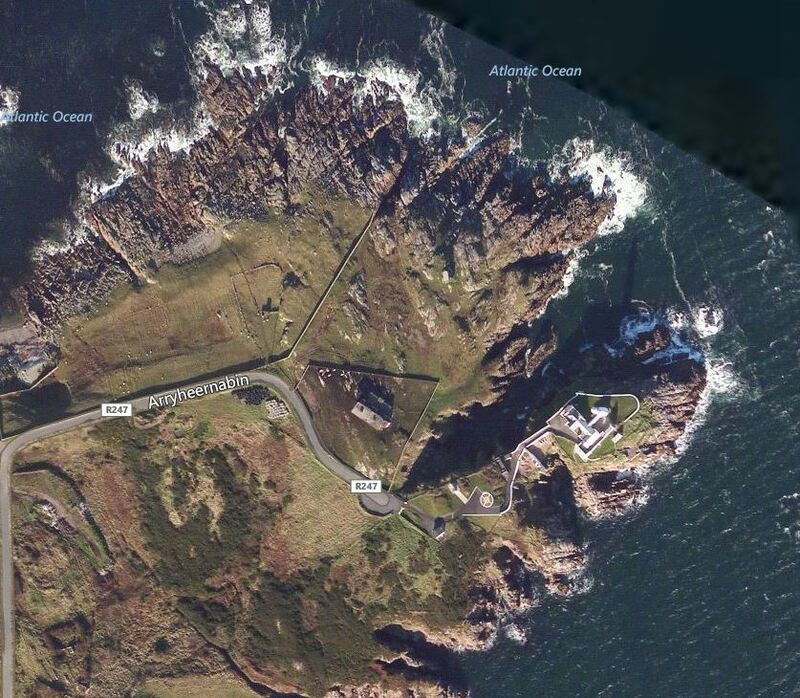 I checked in to the hotel and then headed straight for Fanad. As I mentioned, the lighthouse is very accessible – just step over a small wire fence and the magnificent vista is right in front of you. 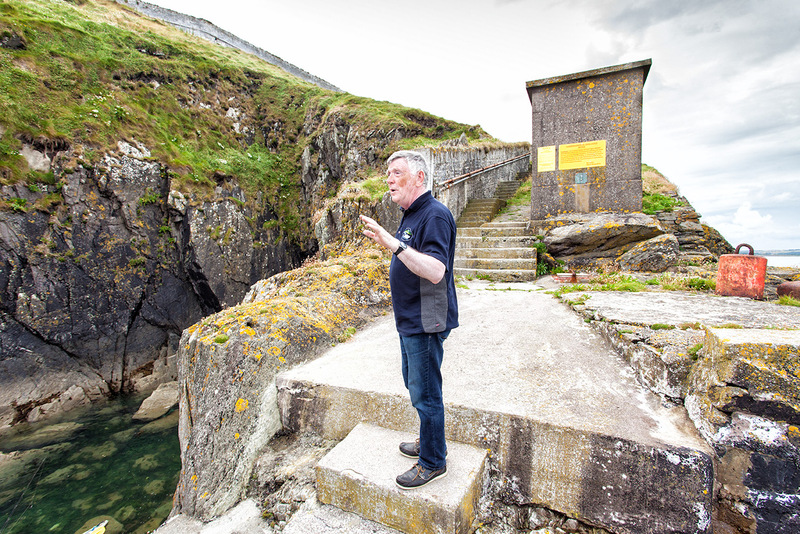 Access to the building complex itself was not available but this is due to change shortly as the Commissioners of Irish Lights in conjunction with Donegal County Council and the Irish Tourist Board will be opening it to the public. 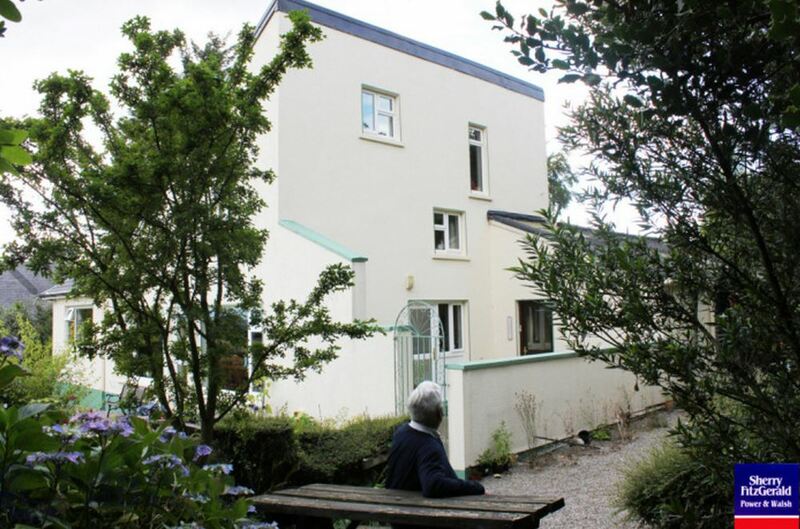 Some of the buildings are being converted to holiday accommodation – surely a prime place to stay for photographers eager to explore this picturesque area for a few days. It was obviously due to the preparations for the imminent opening of the complex that there was a White Van Man present. He was busy hosing down the area around the buildings and I dearly wished that he would finish up as his prominent vehicle was not what I wanted in any of my photographs. He didn’t oblige until 9:30pm, just before the lighthouse started flashing but at least he was gone by then. The white van marring what would otherwise have been a nice photo. I spent some time experimenting with various perspectives from the promontory on the left while waiting for sunset at 9:39pm which would prompt the operation of the light. 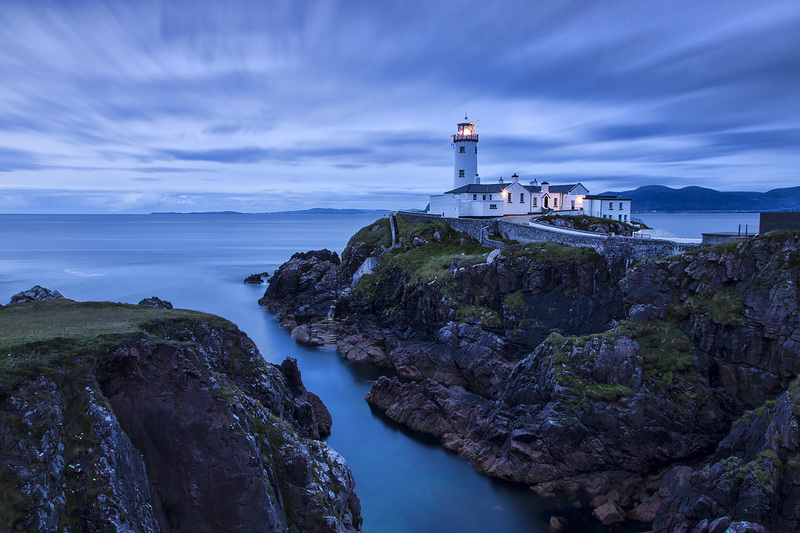 At around 9:30pm some other photographers arrived – clearly on a similar mission to myself – and within a few minutes the lighthouse began to flash. For the next 45 minutes I made several exposures, the time for each increasing as the daylight progressively faded. Finally, having more than enough “in the bag” I collapsed my tripod and packed up my gear. As I walked the short distance back to the car it began to rain. I was very lucky. I could have gone all that way and been rained out. It is a place I would love to go back to and I would especially like to photograph it when the sea is stormy. 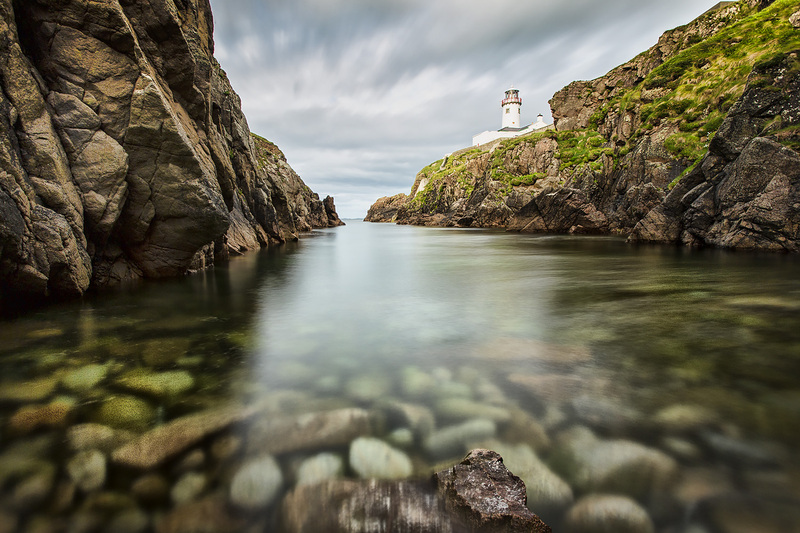 A word of caution though: a County Antrim photographer was swept into the sea and drowned in 2014 while taking photos here in just such conditions. We can often take silly chances for the sake of “that special shot”. That particular tragedy and similar ones around the coast in more recent times should teach us to be extremely careful where the sea is concerned. 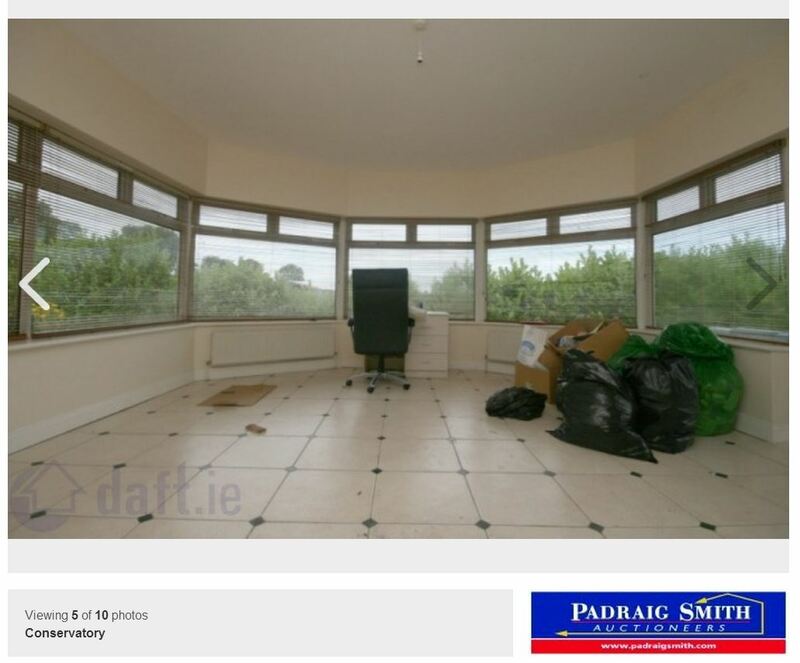 Daft.ie is Ireland’s biggest property site and it’s a valuable resource for anyone thinking of buying or renting property. 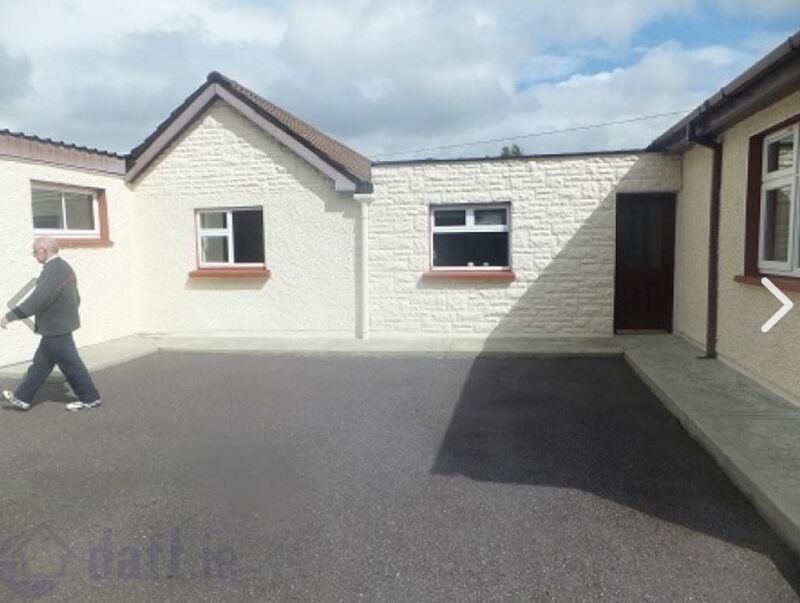 You can browse through images of houses, apartments and commercial premises from all around the country, images that have been uploaded by auctioneers and estate agents. 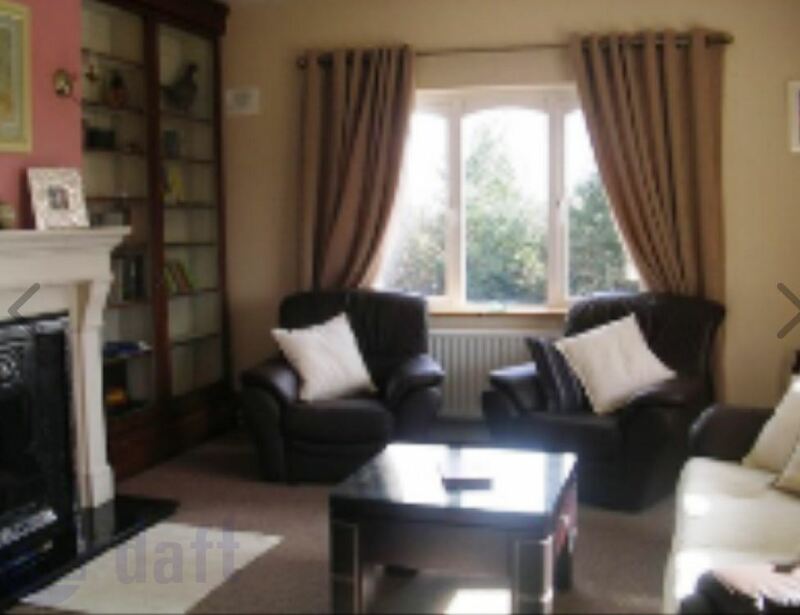 I would love to say that the photographs have all been well-taken – properly lit, in focus and well composed – but, alas, that is not so in a frighteningly large number of cases (if a quick browse through a random sample of properties is anything to go by). 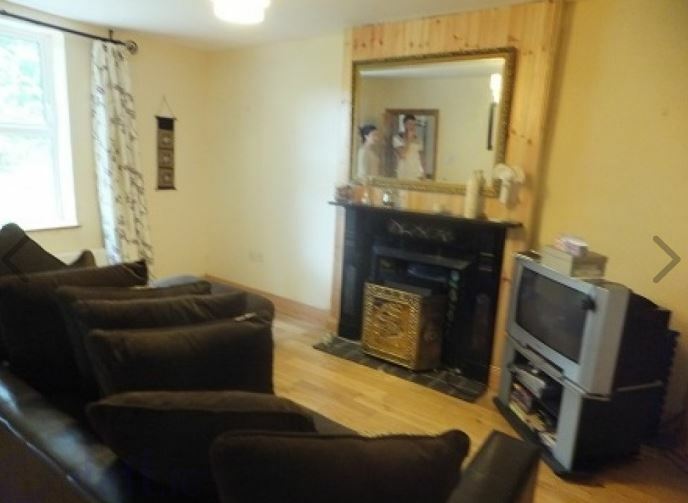 Which prompts the question: why, if you are an auctioneer/estate agent, do you not ensure that properties are presented in the best possible way so as to entice prospective buyers/renters? 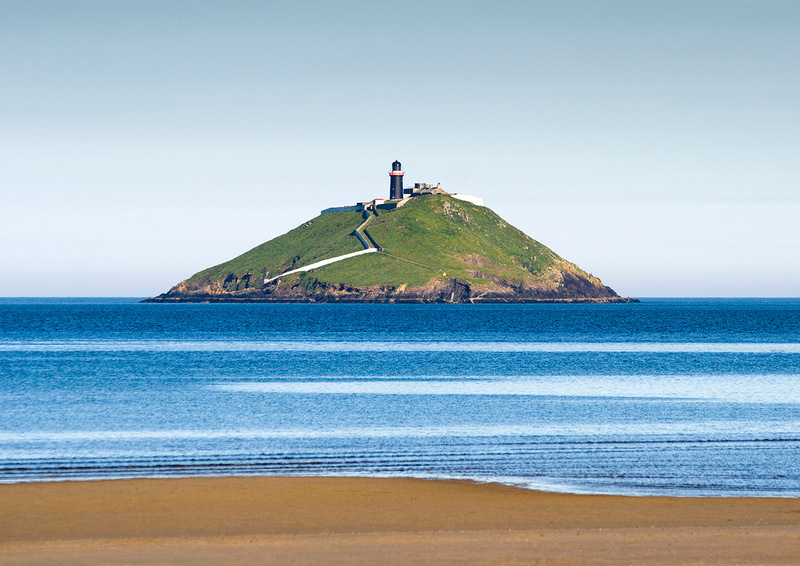 Ballycotton Island from Ballinamona Strand. 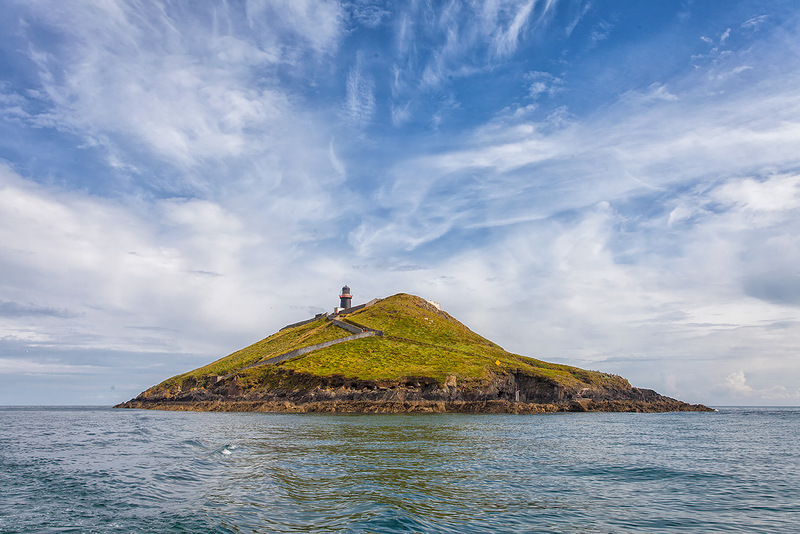 I first set foot on Ballycotton Island three years ago when a local fisherman dropped me off there at 6:30am and collected me four hours later. 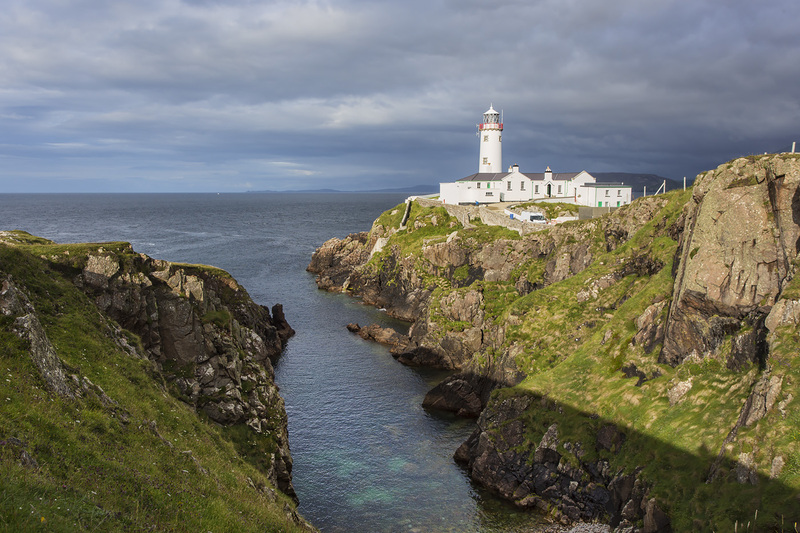 It was highly irregular as visitors were not permitted on the island which is the property of the Commissioners of Irish Lights. Not that it bothered me. I was fulfilling a life-long ambition. 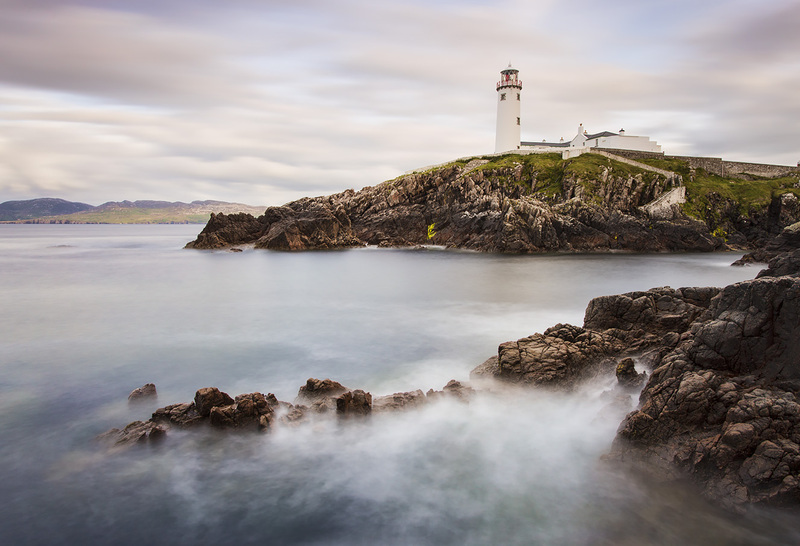 I was reared in a cottage along the coast road to Knockadoon and the island, its powerful light and deep booming foghorn were part of my earliest memories. I therefore made the most of the opportunity when the chance to surreptitiously visit it eventually arose and it was a wonderful experience. I was the only person there for the duration. It was like being marooned on a desert island (but in a good way). There is no need any longer for clandestine visits. 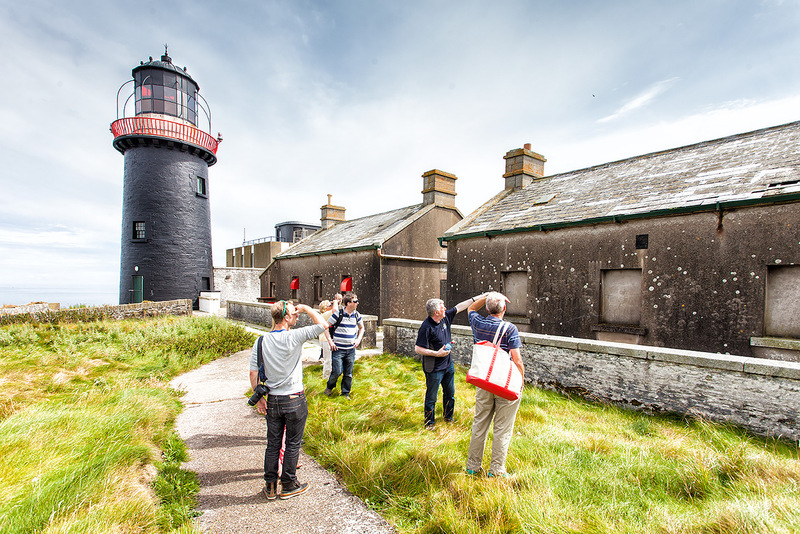 Since July of this year there are organised tours of the island with access the the lighthouse itself (something that was not, of course, available to me on my previous visit). 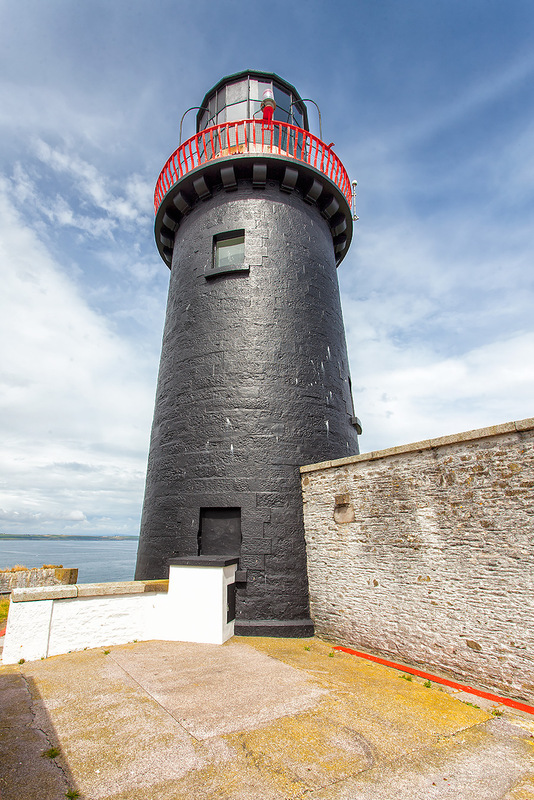 Ballycotton Lighthouse Tours is a new company supported by SECAD (South & East Cork Area Development), Ballymaloe Foods and Cronin Millar Engineering and with the cooperation of the Commissioners of Irish Lights. The driving force behind the initiative is Yasmin Hyde, daughter of Myrtle Allen of Ballymaloe House, and owner of the Ballymaloe Country Relish company. It was she who had the vision for public access to the island and it is great to see that it has become a reality. The newly acquired boat (appropriately named “Yassy”) is licensed to carry 12 people plus crew. The short crossing lasts about 10 minutes and so should be bearable by all but the most chronic thallasophobes. The water was flat calm for our trip. 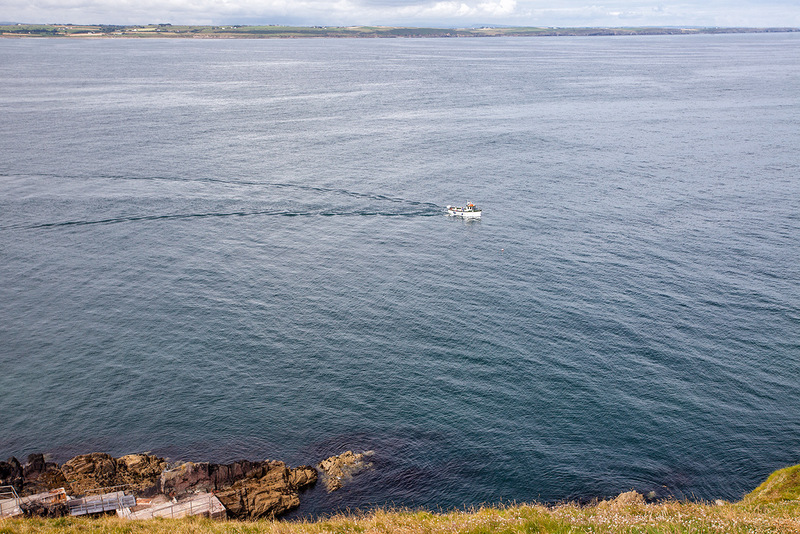 The “Yassy” returning to Ballycotton pier with a group of visitors. The once shining white walls of the island are now a dirty grey due to not being painted for several years. This is a pity and is something the Commissioners of Irish Lights should address. Guide Eddie Fitzgerald at the start of the tour on the island. Eddie telling us about the lighthouse men’s houses. 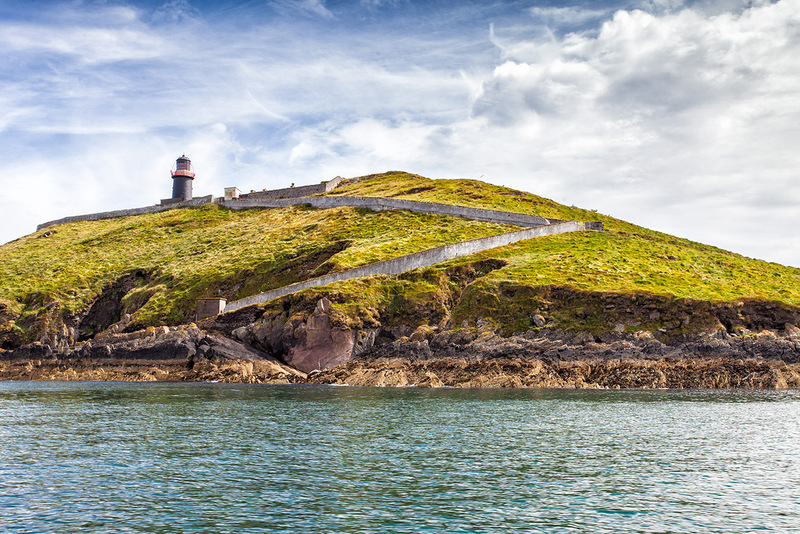 Ballycotton is one of only a few black lighthouses in the world. 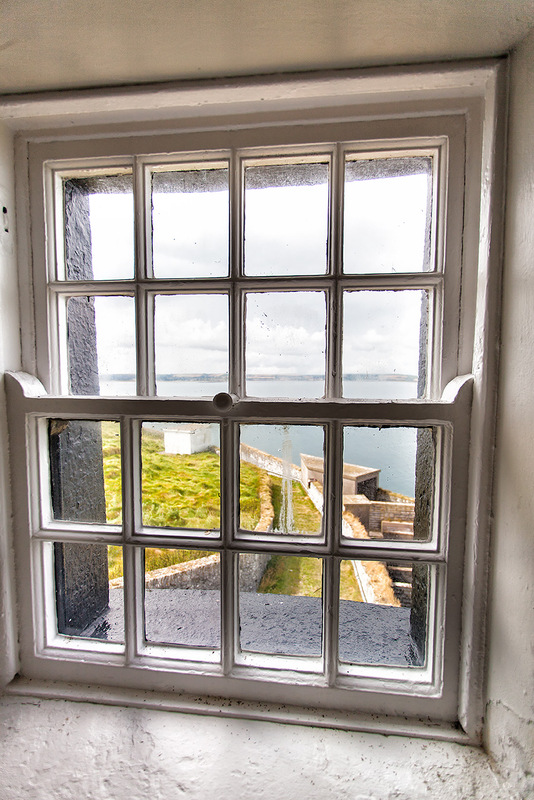 The highlight of the tour for me was entering the lighthouse, climbing the granite steps and walking out on the balcony with its fine views. 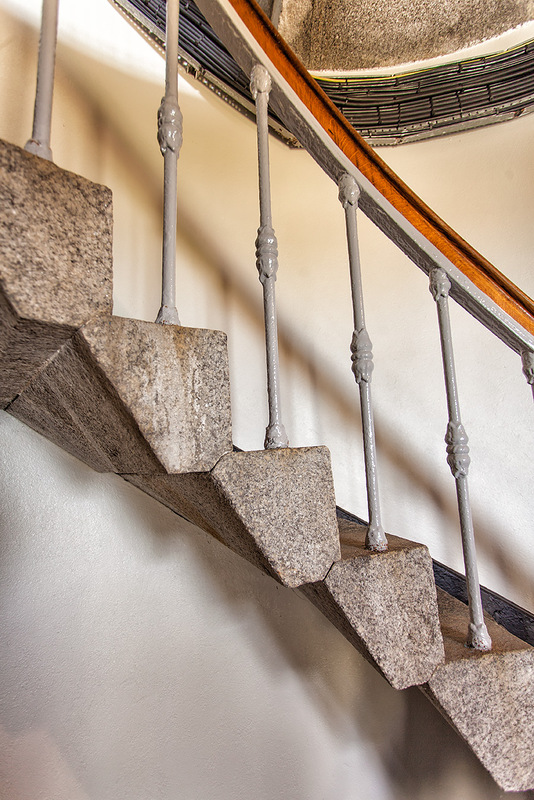 A detail of the consummate workmanship apparent in the granite steps inside the lighthouse. Looking west towards Ballycotton village. Looking East towards Capel Island. 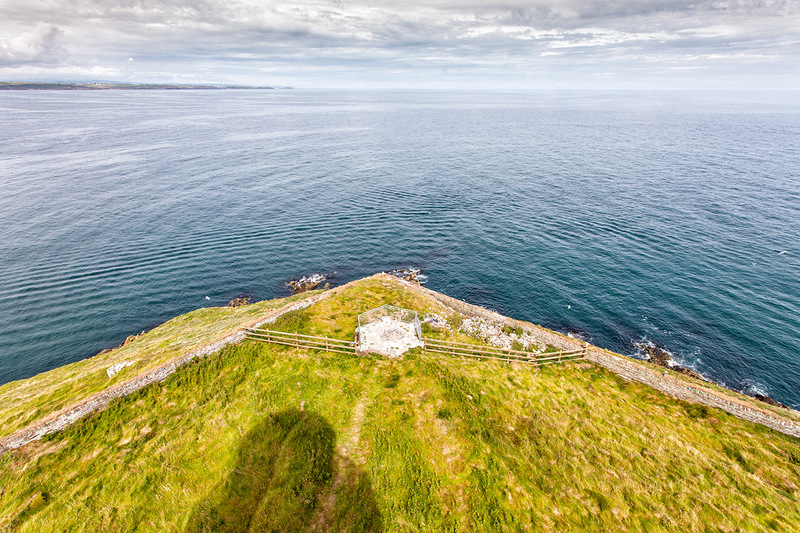 The hexagonal structure in the foreground is the remains of a housing for a bell that was used in the 19th century, before the foghorn, to warn mariners they were near the island. “Yassy” returning to the island with another group and to take us back. The pier on the north side of the island. 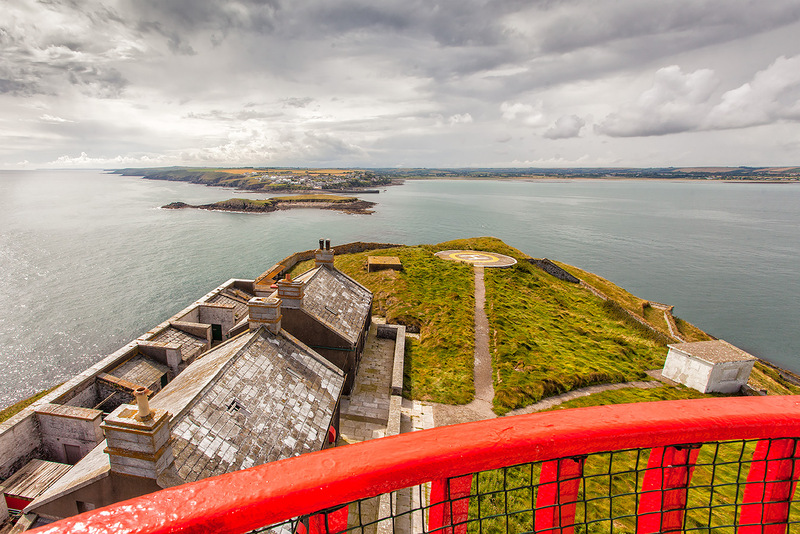 The tour represents a marvelous opportunity to visit one of the landmarks of East Cork and is well worth the price. 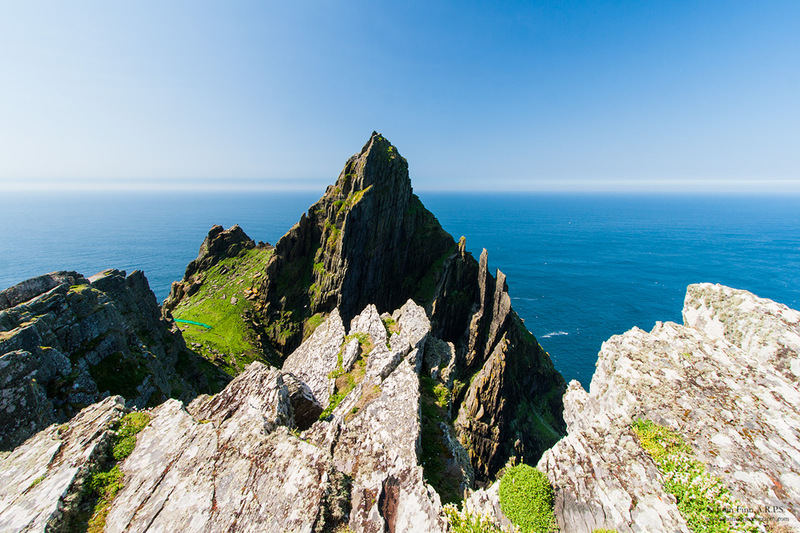 Skellig Michael, a UNESCO World Heritage Site, is located about 12 kilometres off the coast of County Kerry. I have been going there once a year for several years now and the trip never fails to lift the spirit. 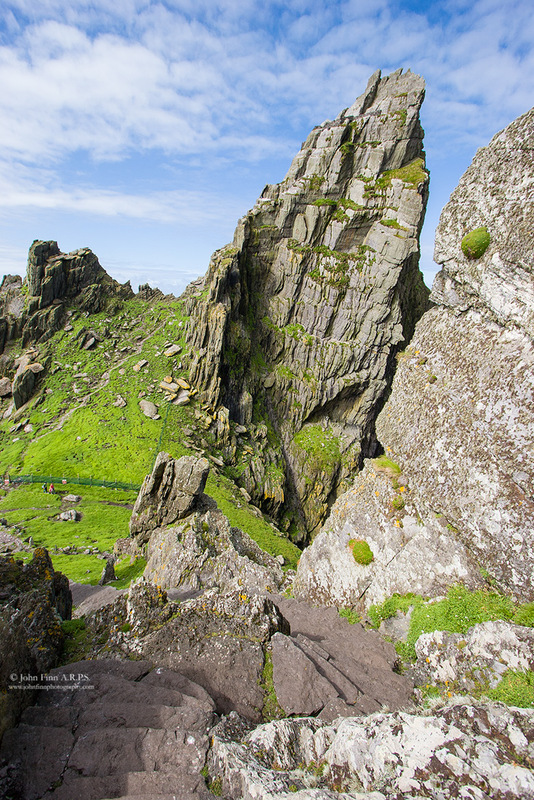 It is Ireland’s Machu Picchu. Others may be found by doing a Google search. In all, about 10 boats with a capacity for 12 persons each make the trip. They leave at 10am and the journey takes about 50 minutes each way. You are given a maximum of 2½ hours on the island. 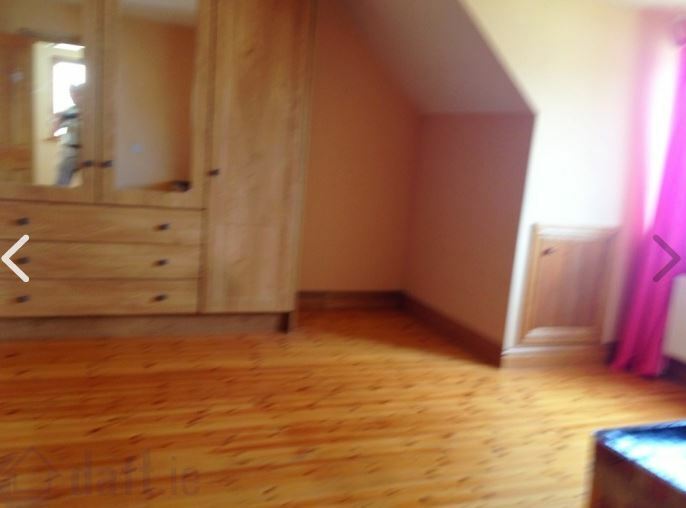 Expect to pay upwards of €50 a head. Believe me, it’s worth it. Be aware that the crossing can be very rough. 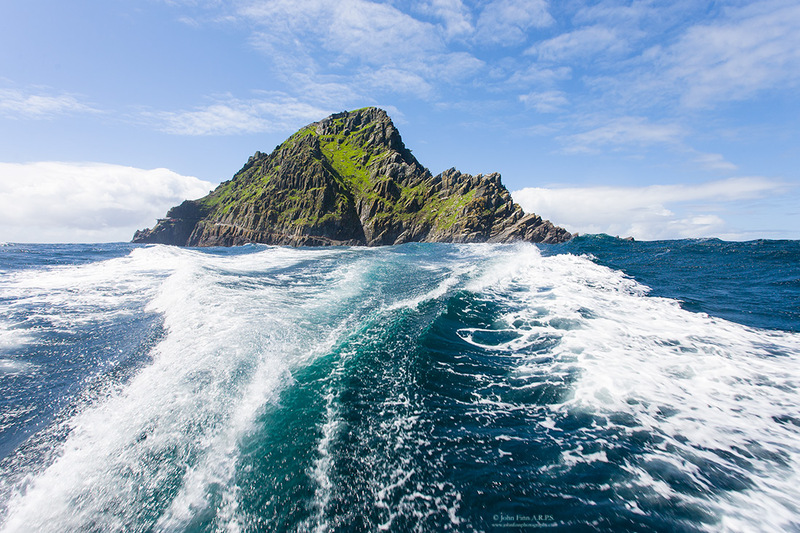 My single most scary boat-trip ever was to Skellig Michael a few years ago. The sea was flat calm in the inner harbour at Portmagee but once we hit the open sea it became a white-knuckle ride. It was like being on a roller coaster with someone throwing a bucket of water at you every 30 seconds or so. Amazingly, none of the 12 passengers, all clinging on for dear life on the open deck, got sea-sick. We should have expected the worst, I suppose, when the skipper insisted on us all donning yellow oilskin jackets and trousers before we embarked. 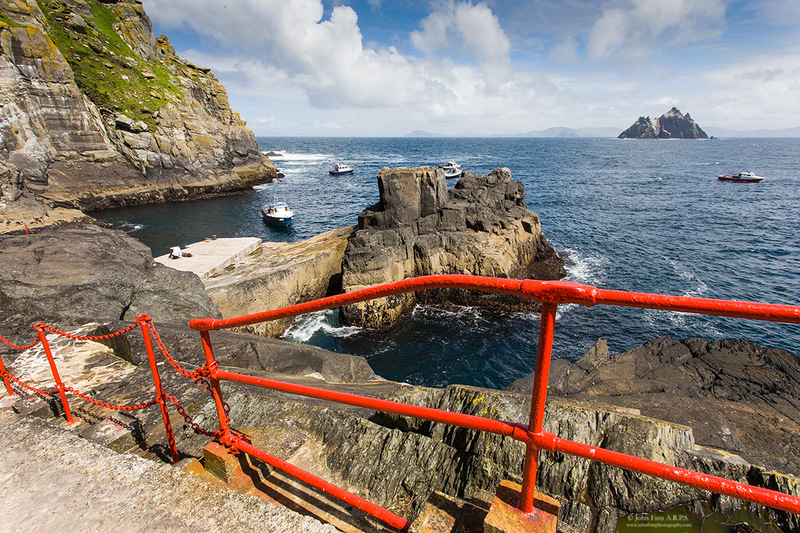 Be aware also that there are no facilities on the island – not even a rock you can go behind – so be sure to visit the public toilet at the entrance to Portmagee before you set out. Neither is it a place to visit if you don’t like heights and/or are prone to vertigo. 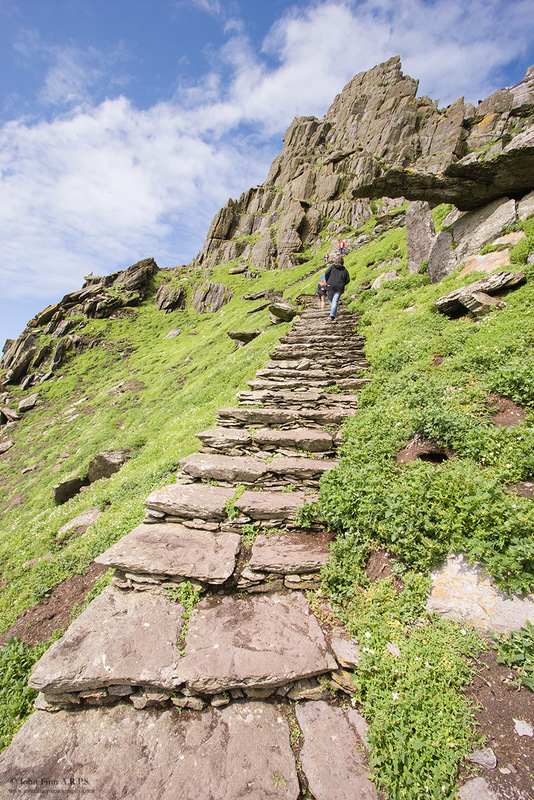 There have been fatalities among visitors, most recently in 2009 when 2 American tourists died – on separate occasions – from falling from a ledge near the beginning of the stone stairway. 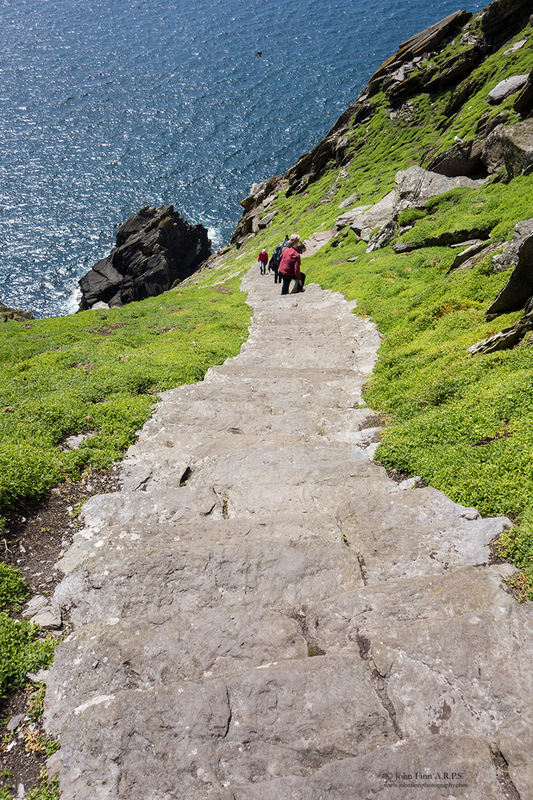 There are 700 steps up to the remains of the monastic settlement on the top of the island and it can be very challenging for anyone who is unfit. 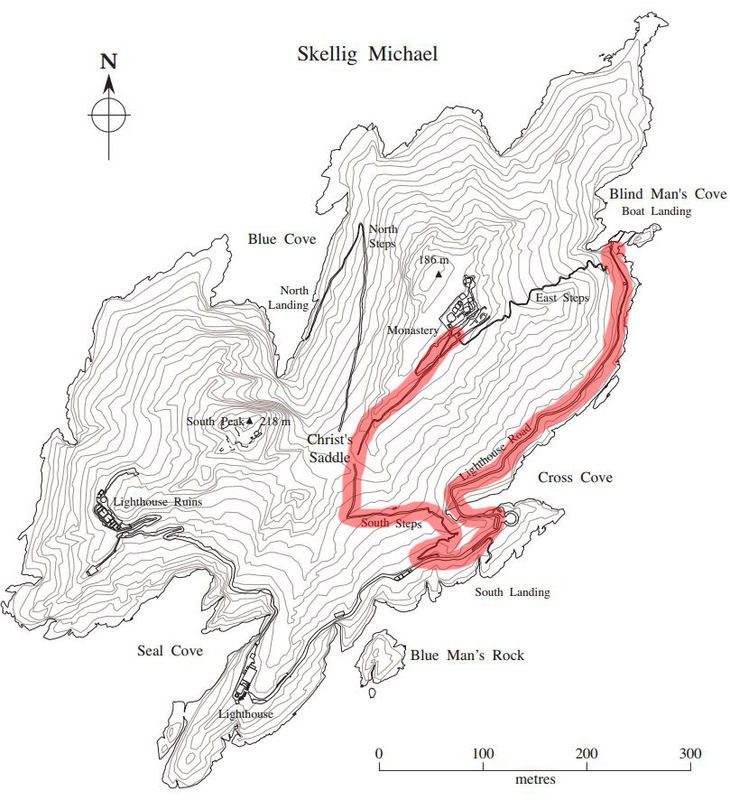 The route that visitors are confined to is outlined in red. 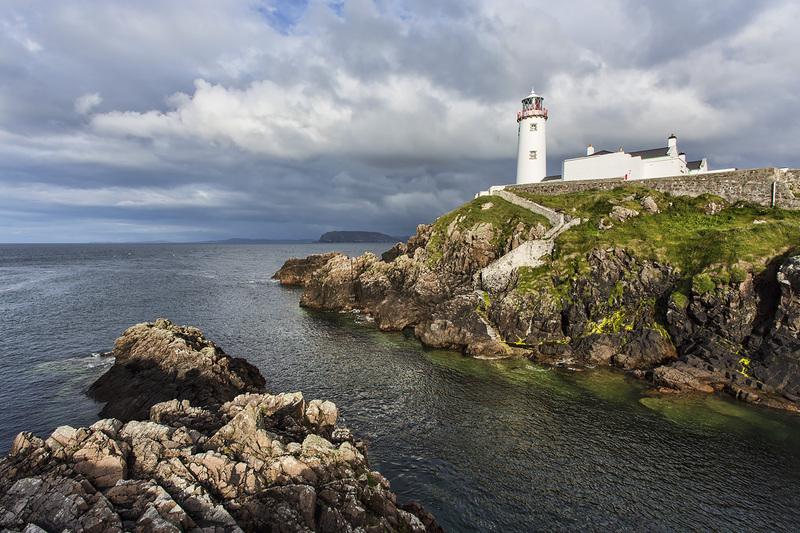 After disembarking from the boat, the route follows a gentle incline along the Lighthouse Road. 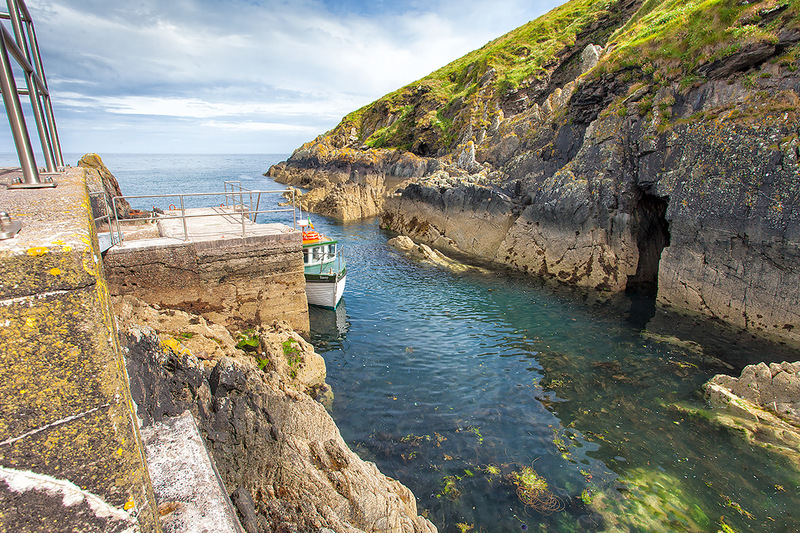 Blind Man’s Cove – where the boats drop off and collect visitors. 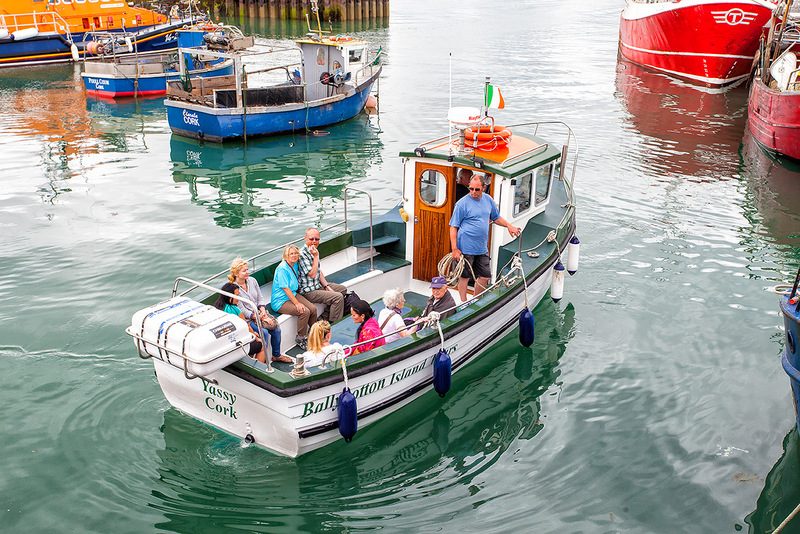 Getting on and off the boats can be tricky when the water is choppy – you have to carefully time your jump from the boat to the pier and vice versa. 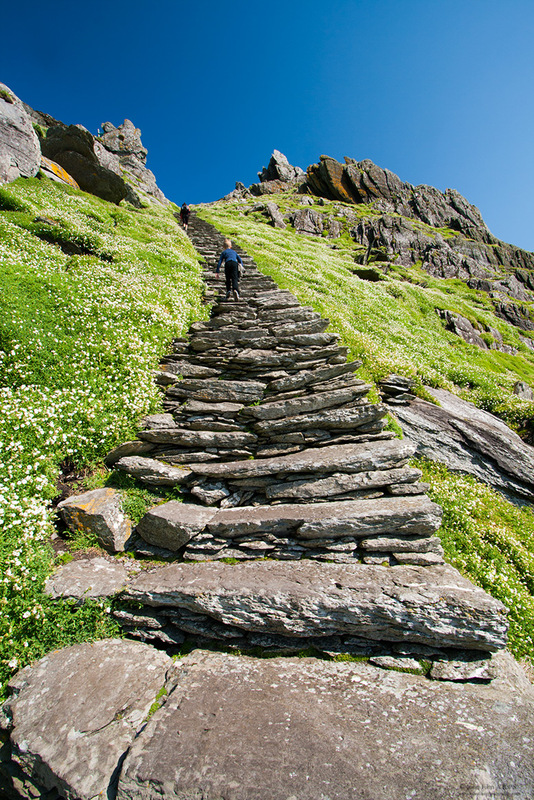 It is only when one comes to the South Steps that the challenging part begins – the steep climb to the top. Some people, realising that it is beyond their capabilities, are content not to wander beyond this point and are happy to relax in the sunshine and watch the birds instead. On my last visit (5th June 2014) there was a guide at the bottom of the steps who gave a safety lecture to everyone before allowing them to go further. The start of the South Steps. The most dangerous part is where the lady on the right is walking. To her left is the 20 foot drop where the recent fatalities occurred. 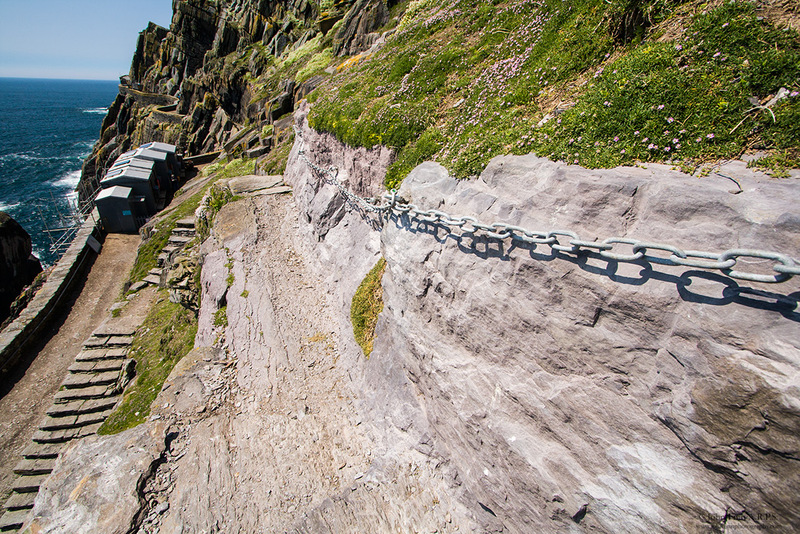 A chain has since been inserted in the rock as a safety measure. The dangerous ledge with safety chain. 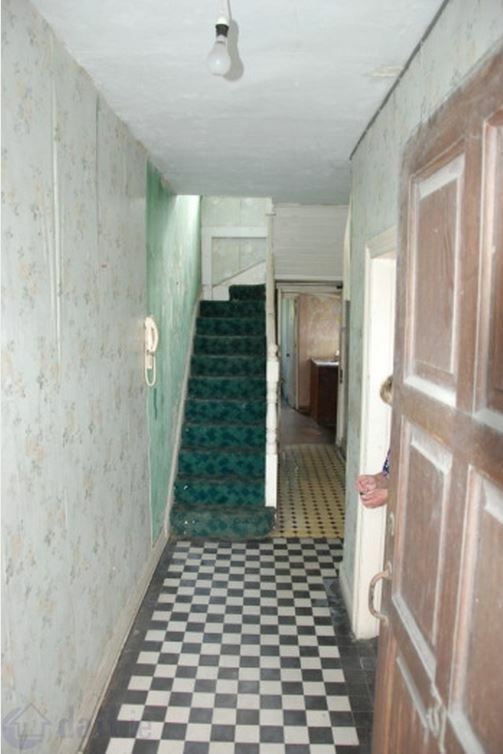 Notice the absence of handrails. There had been demands for them in the aftermath of the recent deaths but, wisely, the Office of Public Works (which looks after the island) refused to countenance them as they would detract from the character of the place. It is a wilderness area and it is important that it remains so. Excavation and restoration work has been ongoing every summer since 1978 in order to learn more about the monastic settlement and to preserve it for future generations. 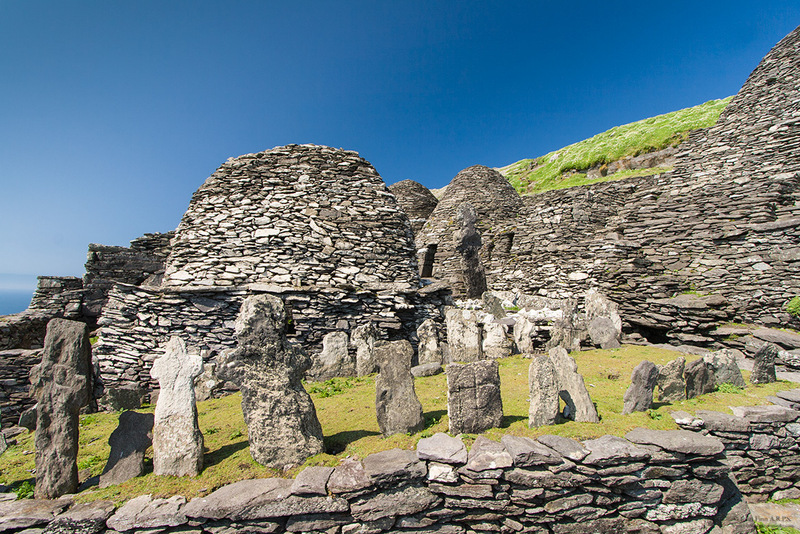 It is not known exactly when the first monks came here but it is probable that it was in the 6th Century. 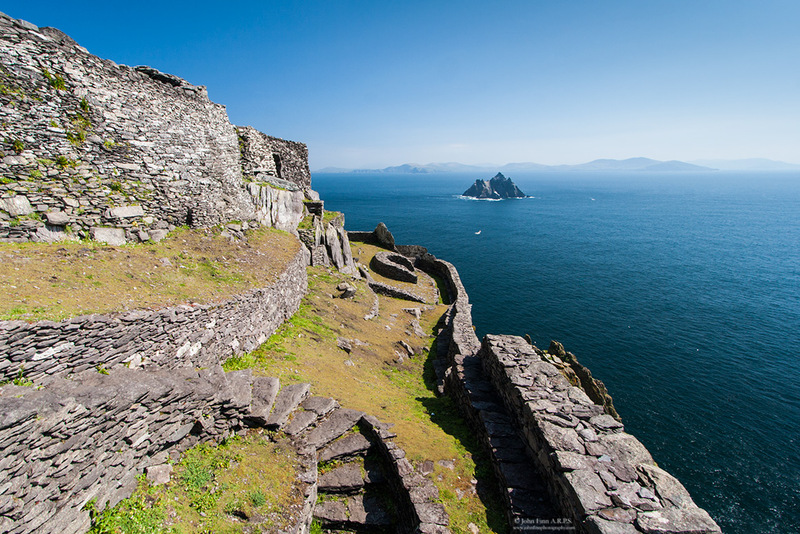 The earliest written record of a monastery was in 824 AD when there was a Norse raid on the island. 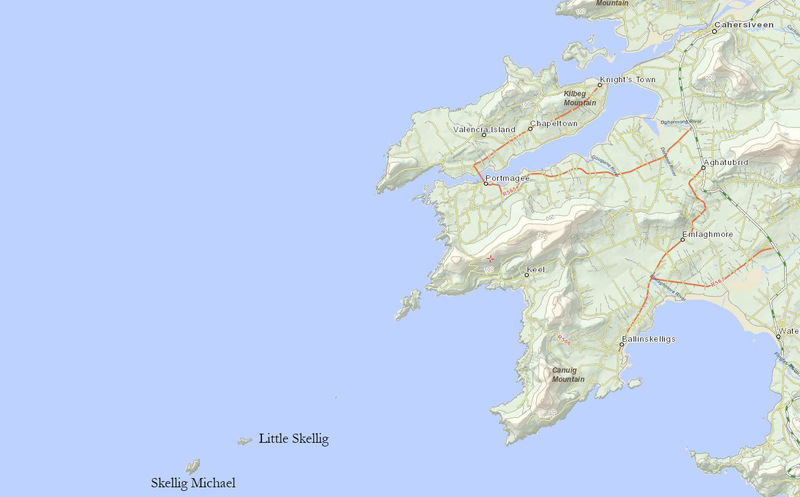 By the 11th Century the island had been dedicated to St Michael and probably became a place of pilgrimage around this time too. 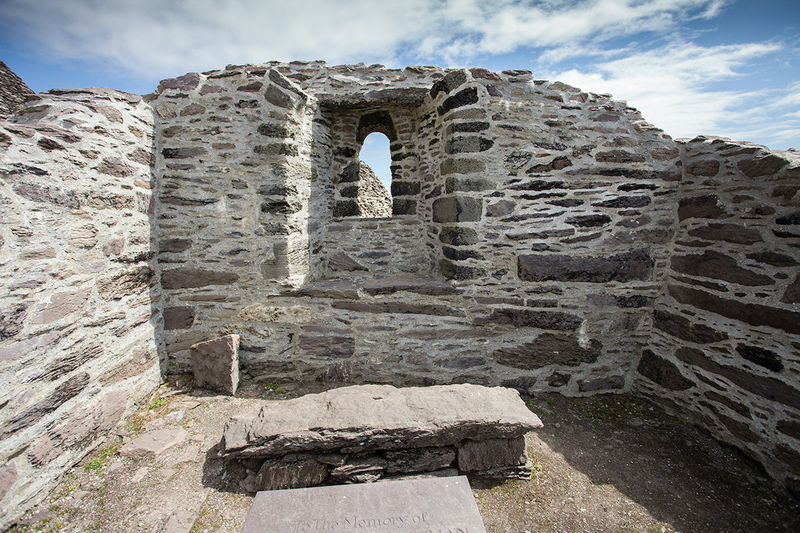 Monks continued to live here until the late 13th Century when, due to climate change resulting in colder winters and stormier seas, and changes in Irish ecclesiastical structures, they left for the mainland and settled in Ballinskelligs. It is likely though that some monks returned for the summer months for a long time after that. 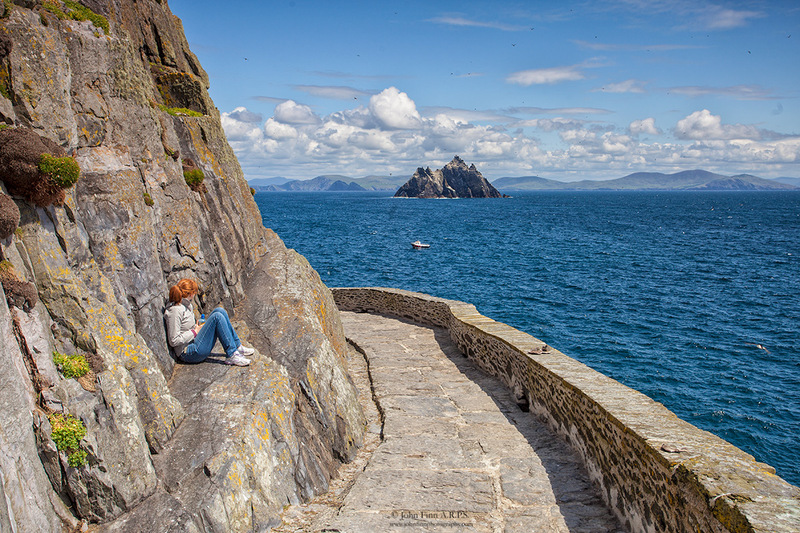 The island continued to be owned by the Augustinians until 1578 when, in the aftermath of the Desmond Rebellion, Queen Elizabeth 1 dissolved certain monasteries that had been under the Earl of Desmond’s protection. 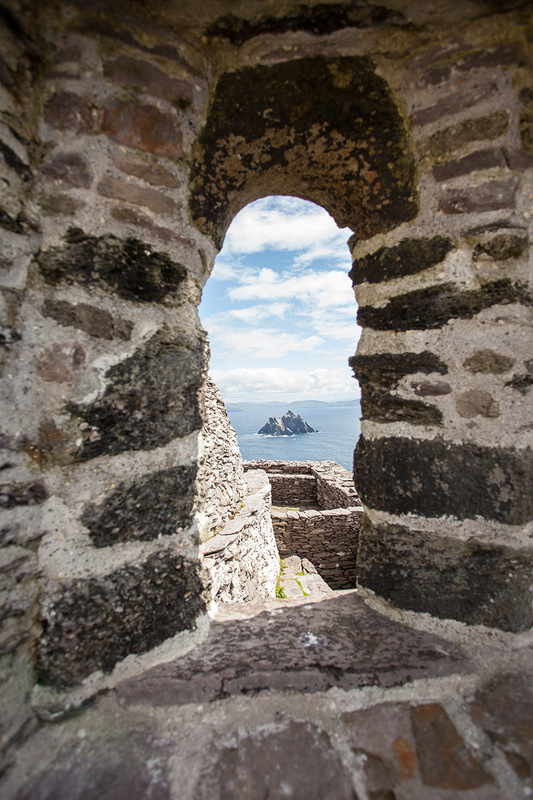 Skellig Michael was given to the (secular) Butler family and it remained with the family until 1820 when it was purchased by the Corporation for Preserving and Improving the Port of Dublin – the predecessor of the Commissioners of Irish Lights – which wanted to build 2 lighthouses on it. 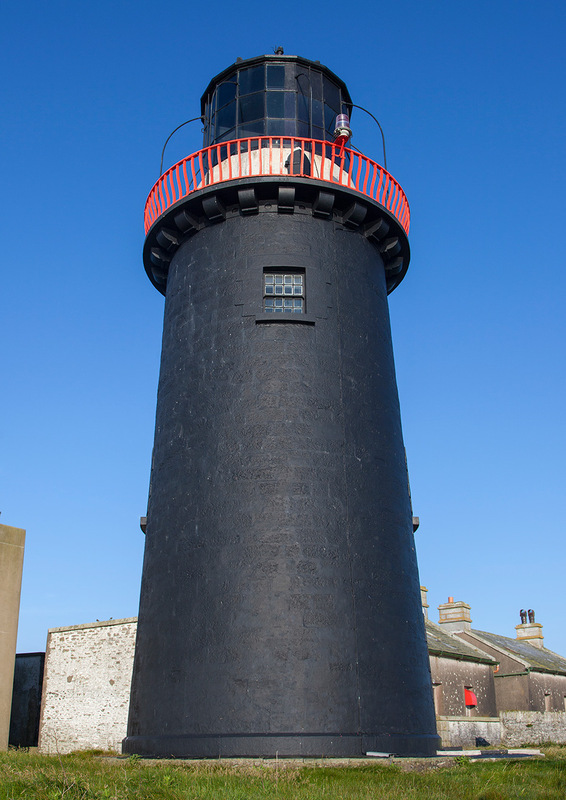 The building of the lighthouses was completed in 1826. During the construction period the workers occupied the ancient beehive cells in the old monastery. In 1880 the Office of Public Works took over responsibility for the monastery and this has continued to the present day. 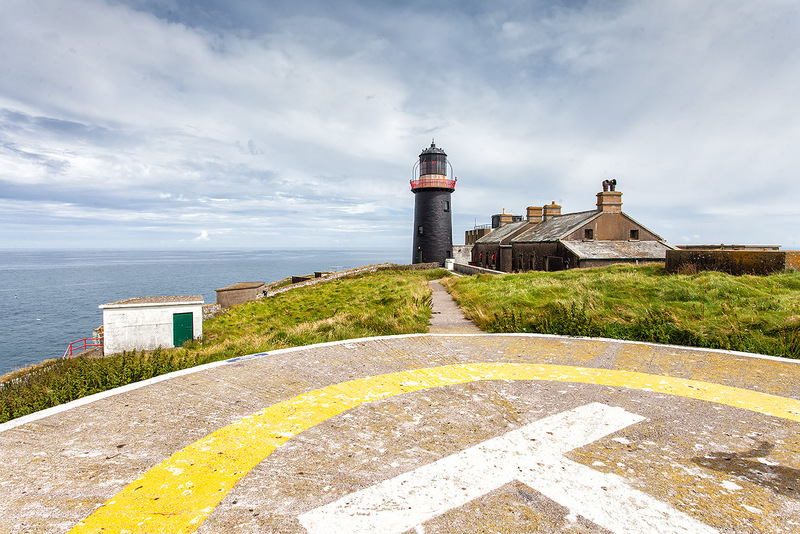 Apart from the heliport and the lighthouses (only one of which is still operational) – the property of the Commissioners of Irish Lights – the island is owned by the Government of Ireland. It is a National Monument by reason of its historical, architectural and archaeological importance. It 1996 it attained UNESCO World Heritage status due to its “outstanding universal significance”. 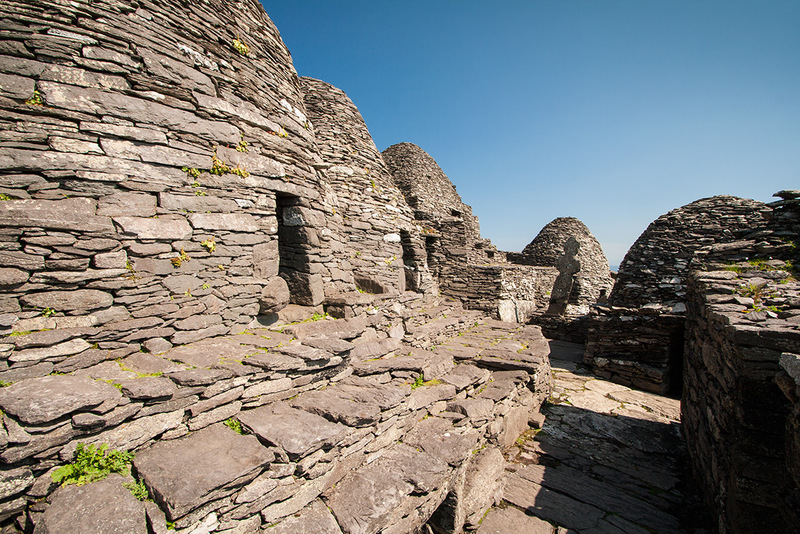 The beehive huts, so-called because of their resemblance to beehives, which housed the monks. 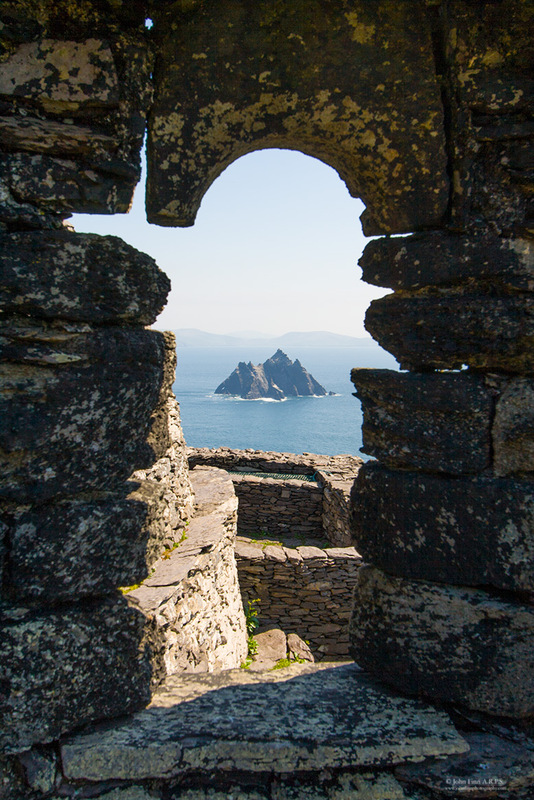 Looking across to Little Skellig and the Kerry Coast from the monastery. The Romanesque window in St Michael’s Chapel before the restoration work of the last two years. The window as it is now. A wider view of the newly restored chapel. I have to say I got an unpleasant shock when I saw the newly restored chapel. I appreciate that the Office of Public Works’ archaeologists and architects must know best as far as restoration work is concerned but I think they have gone overboard in their use of cement mortar. It looks ugly and out of character with the rest of the settlement. Perhaps the light grey look will darken with weathering over time. The South Peak from the high ground above the monastery. The South Peak from the top of the steps. Christ’s Saddle from the base of the South Peak. Note the final section of steps leading up to the monastery (not in the picture). 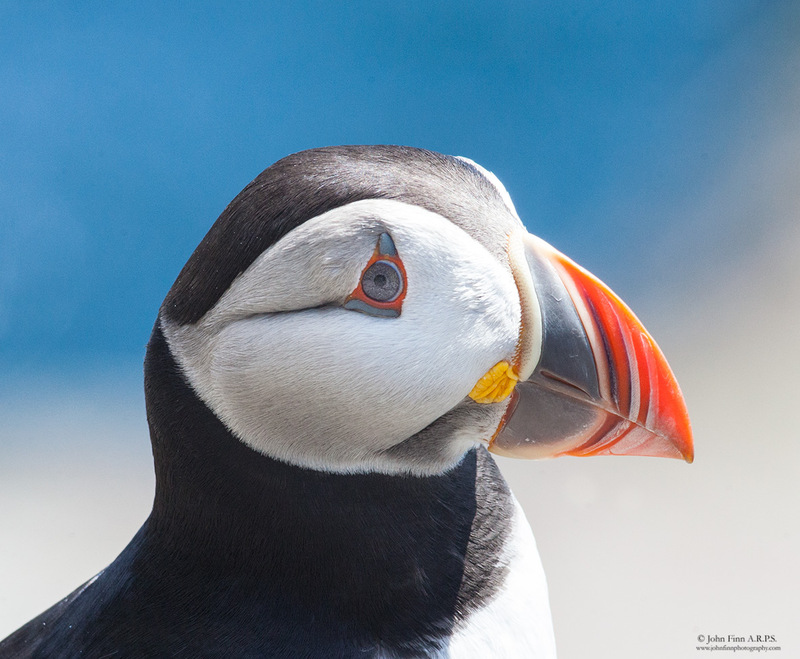 For a few weeks in late May and early June each year Skellig Michael is home to hundreds (if not thousands) of Atlantic Puffins. 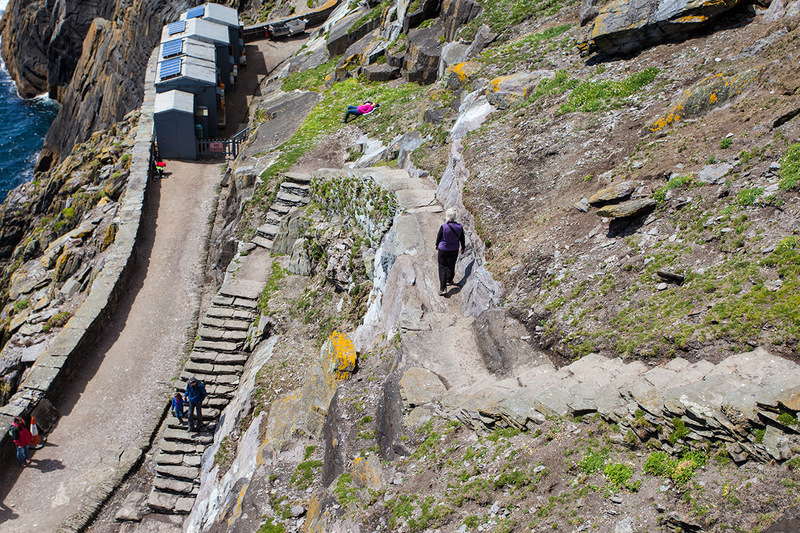 They nest in burrows many of which are alongside the steps so the birds are often literally within arms length of visitors. 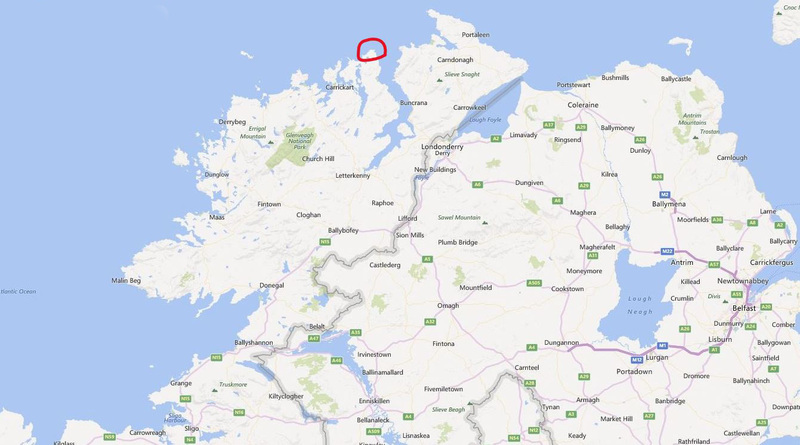 I doubt if there is anywhere else in Britain or Ireland where it is possible to be in such close proximity to them. 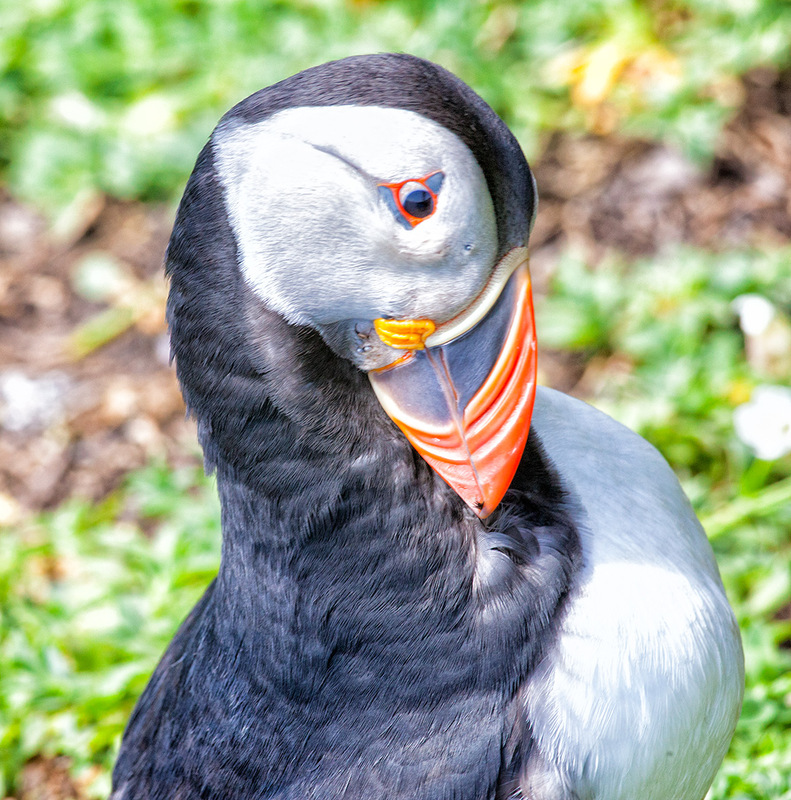 I have photographed Puffins on the Great Saltee Island off County Wexford but it is an achievement in itself some years to see any there, let alone photograph them. 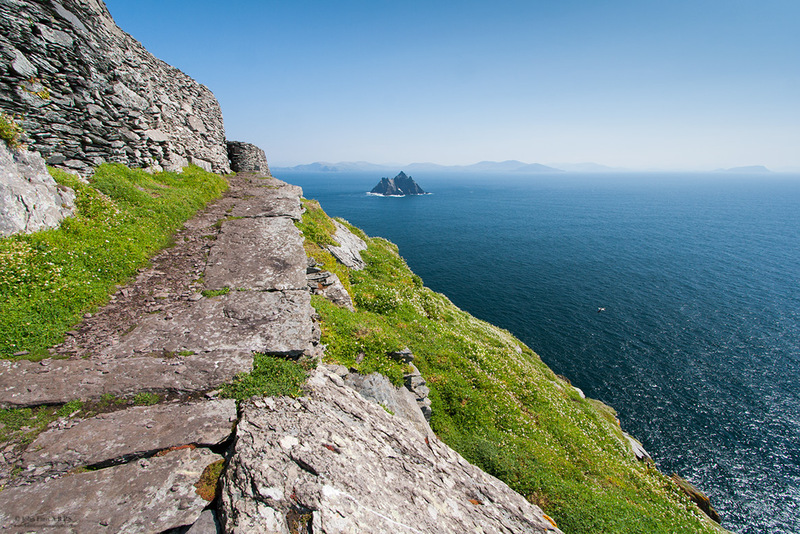 It is an extraordinary sensation, by contrast, to see them so plentiful on the Skellig. 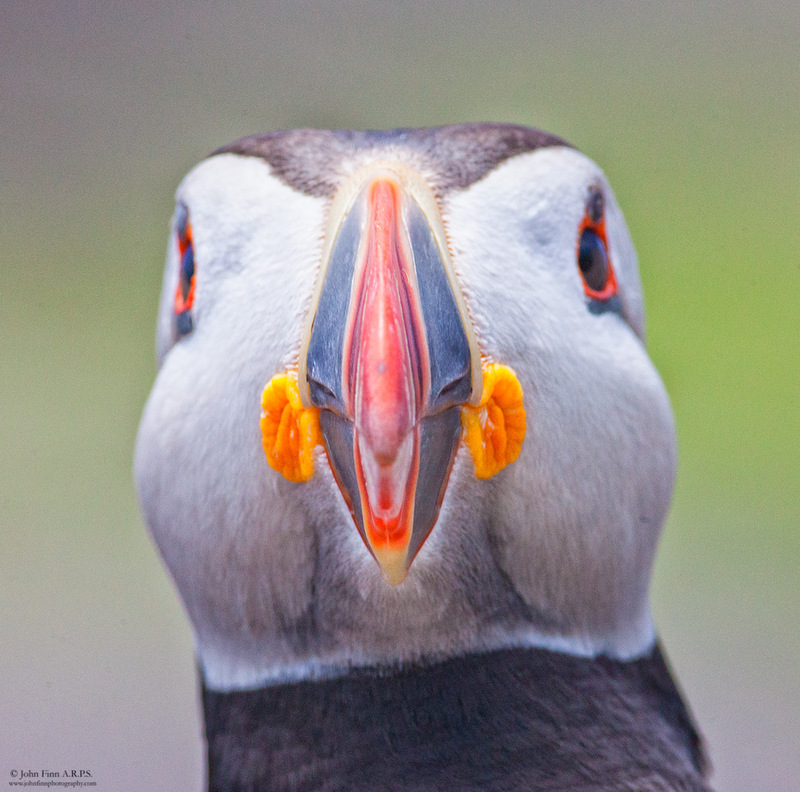 All these were photographed with a Canon 400mm lens with an extension tube attached so as to facilitate a closer focusing distance than the 3.5 metres allowed by the lens such was the nearness of the birds to the camera. 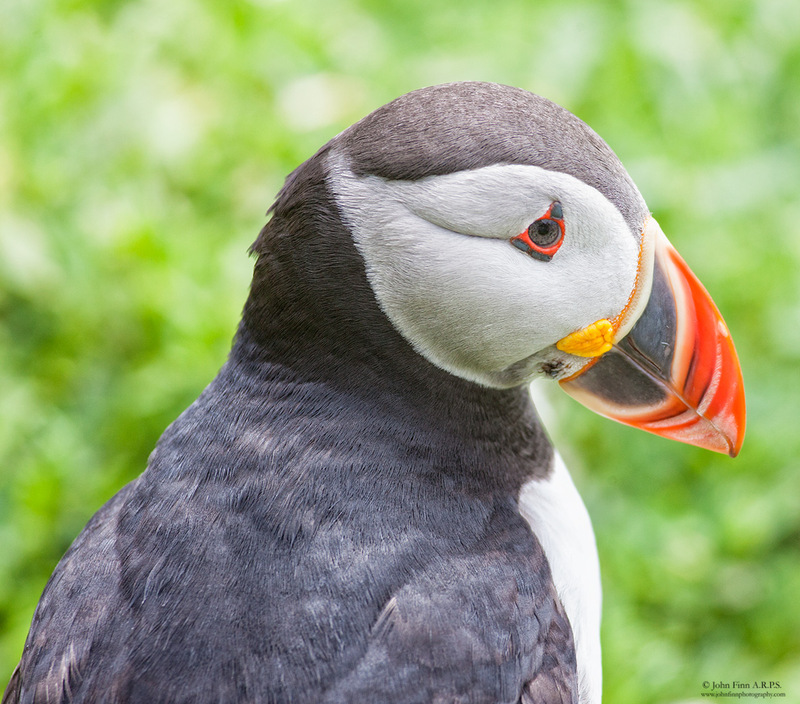 The 2½ hours on the island is just enough to visit the monastery and spend some time admiring the spectacular scenery and perhaps photographing the birds. Most of the island is out of bounds to visitors primarily because of the danger from the precipitous peaks and cliffs. Visitor numbers also need to be managed because of the possible deleterious impact of too much footfall on the ancient remains. 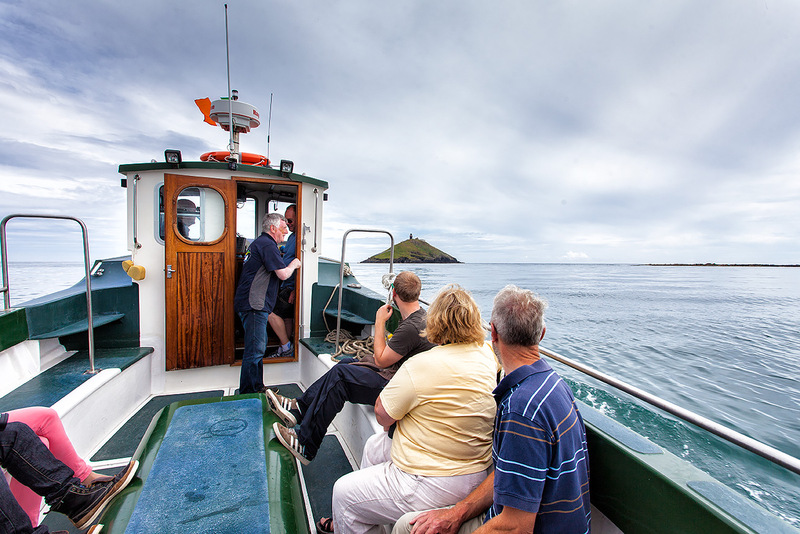 The weather helps in this regard as there are often days during the summer when it is not possible for the boats to set out because of heavy seas or driving rain (visitors are not allowed if it’s raining as the wet steps would be too dangerous). 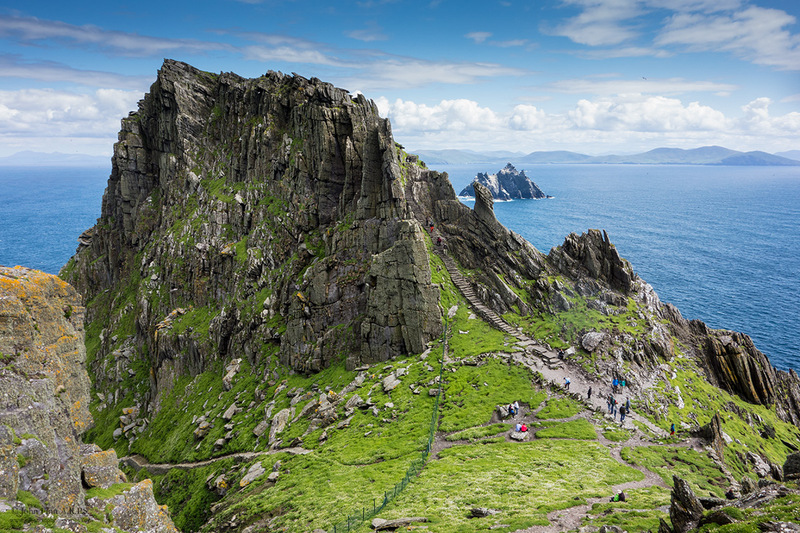 I would strongly recommend more Irish people to visit this national treasure. I’m always struck by how few Irish there are on the boats. Many people tell me that, yes, it’s on their bucket list and they’ll get around to it someday. 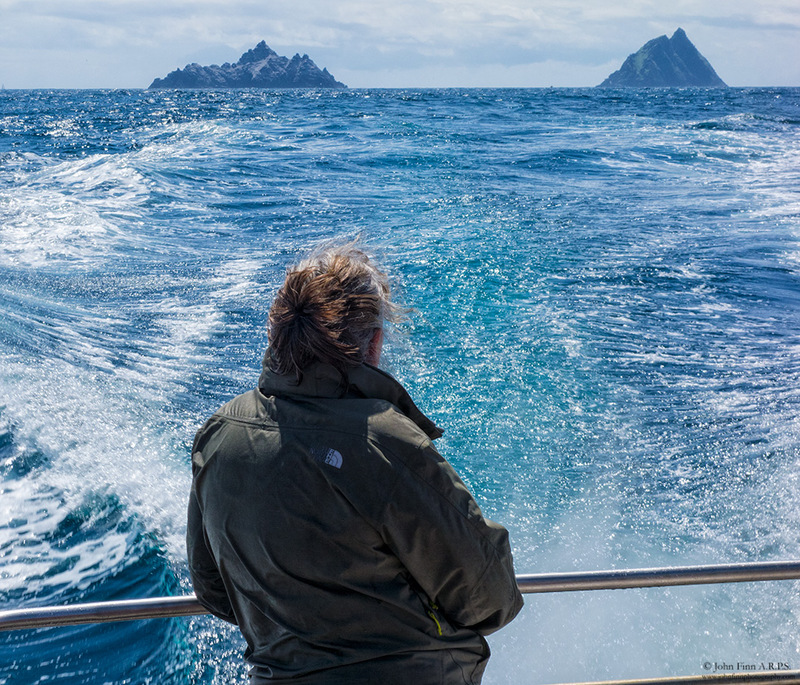 Heading home from Skellig Michael. 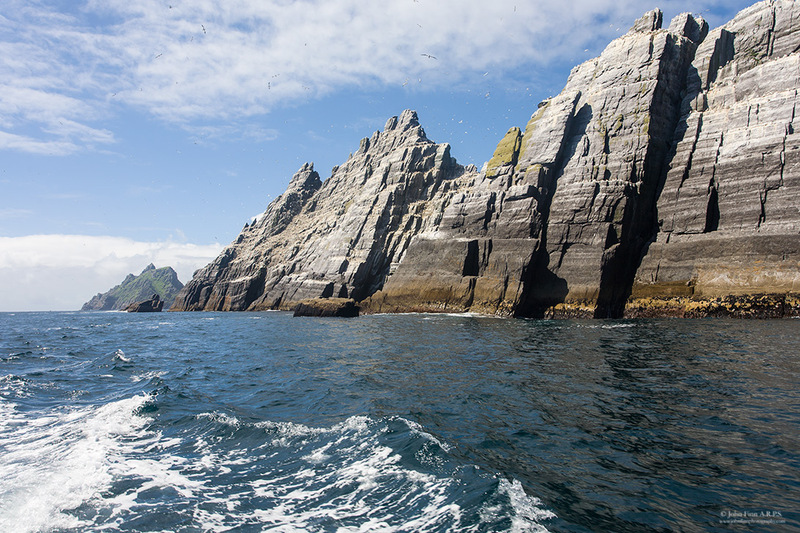 The boats usually sail by Little Skellig – home to 20,000 Gannets – on the way back. 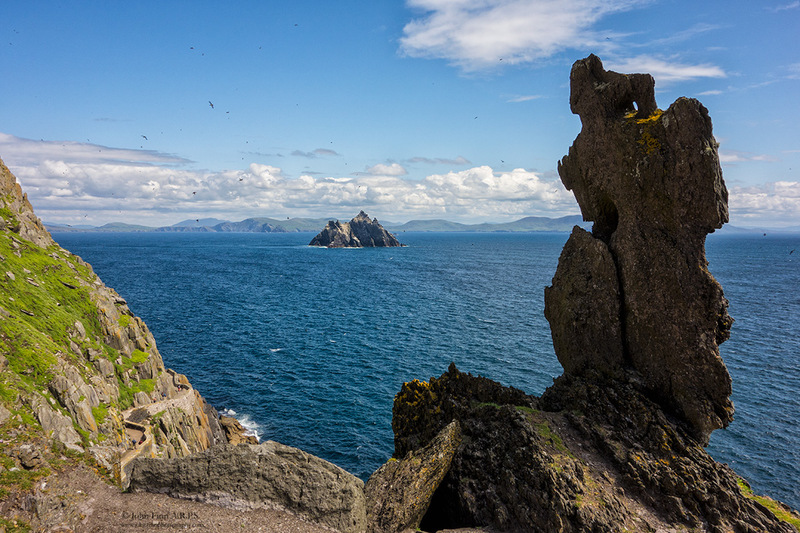 Looking back at Little Skellig (left) and Skellig Michael (right). It is not good enough to use a 10-year-old compact camera to fire off a few out-of-focus shots and hope for the best. Get a proper photographer to do the premises justice. He/she will know how to expose properly for even the darkest of rooms, will be able to use artificial lighting to best effect, and will compose both interior and exterior shots so that the final images will enhance and flatter. 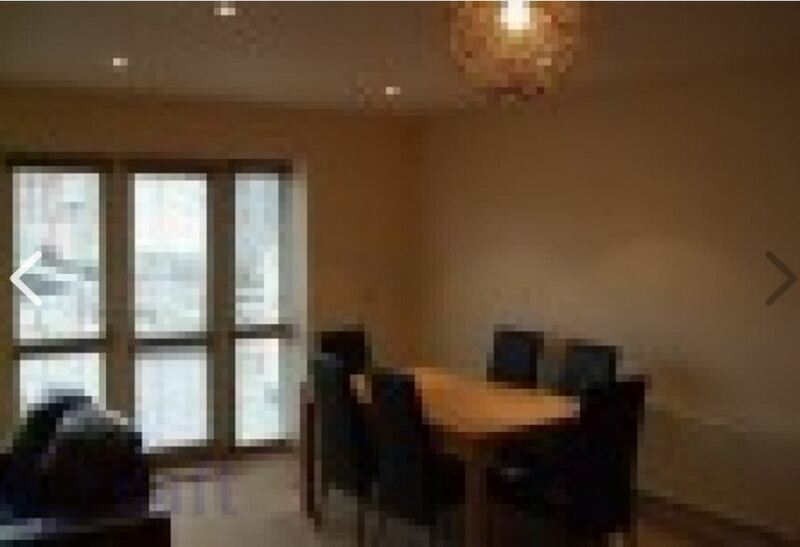 Of course, many acutioneers/estate agents do just that, as their photographs show. But as for others …. 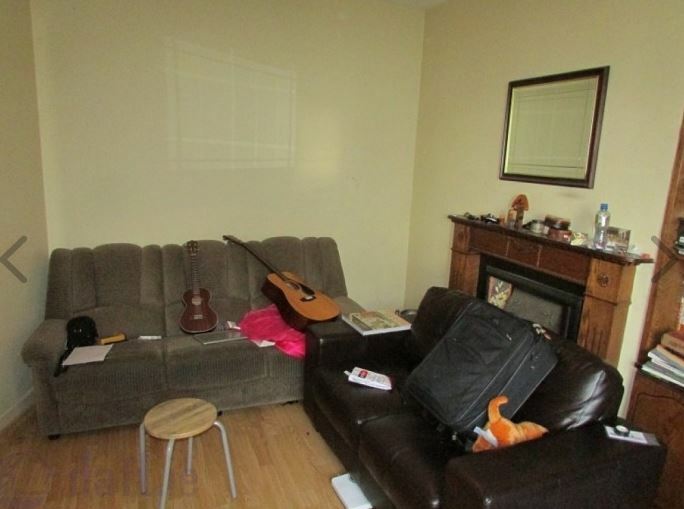 It’s a no-no to have people in property photos (unless they are being sold with the house – the listing in this instance made no mention of it). 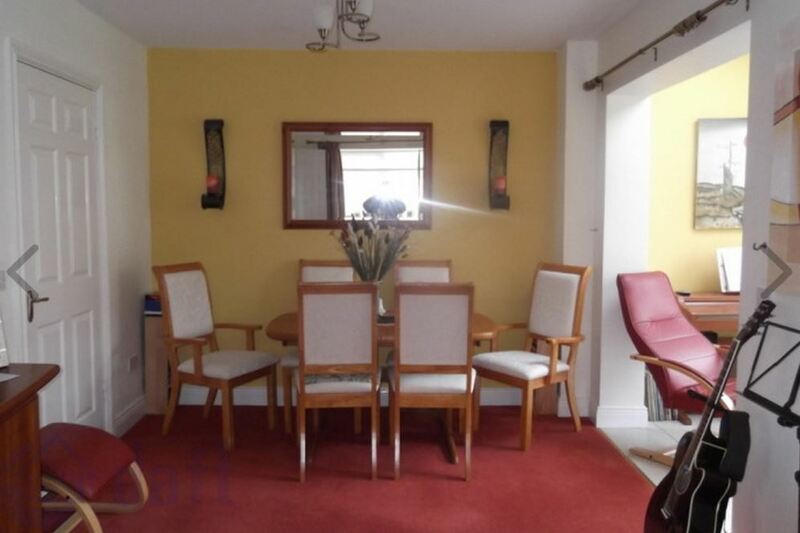 How difficult would it have been to (a) move the vehicles out of view and (b) get rid of the clutter on the chairs? 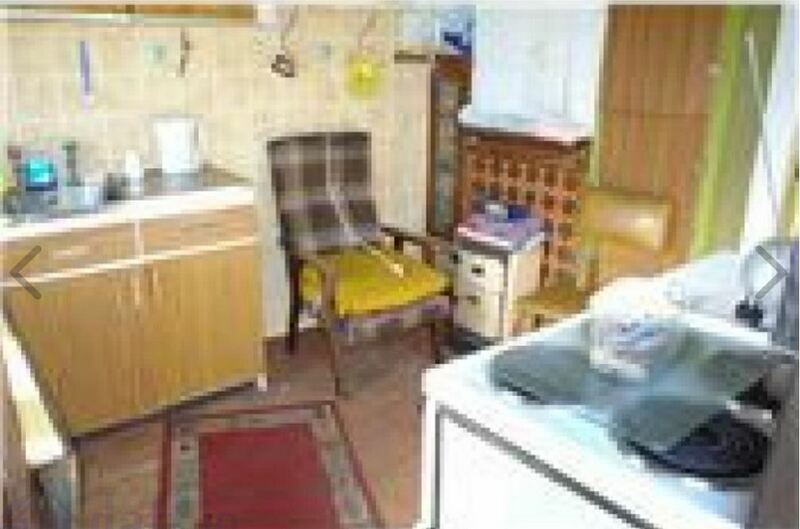 Not the most attractive of kitchens even without the clutter but why photograph it in this condition? Bad lighting, bad angle …. bad EVERYTHING. Unless the doggie is going with the property he/she should have been omitted. 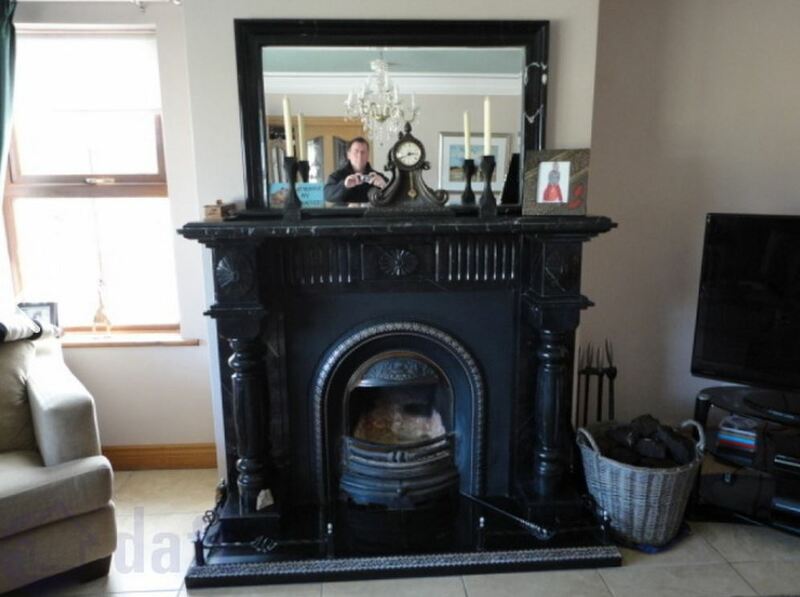 Another wonky angle, camera shake, reflection in the mirror classic. 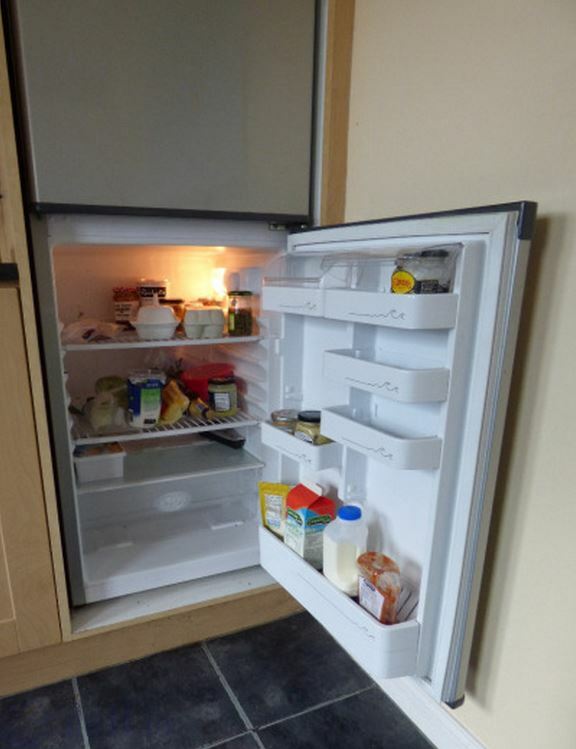 Because one thing prospective purchasers want to see is the contents of the current owner’s fridge. 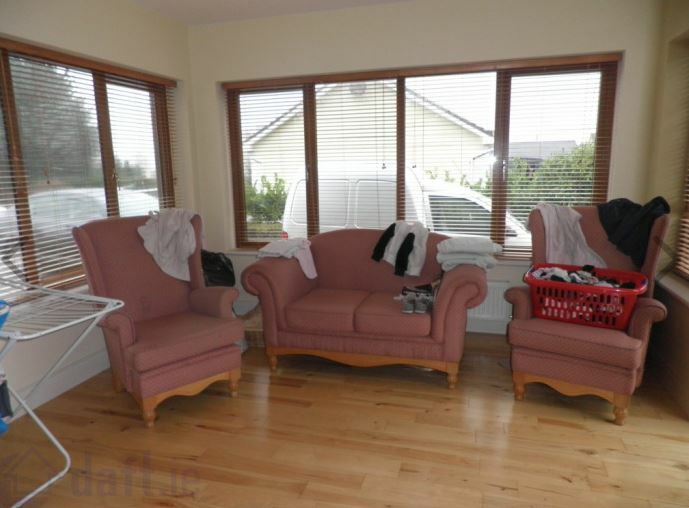 From County Mayo, another property photographer going for the impressionist look. Very artistic. 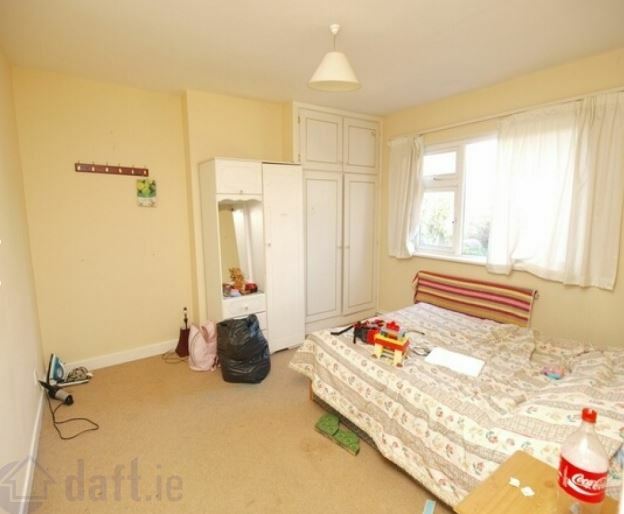 It would have taken only two minutes to tidy the room and get rid of the clutter. Yet more clutter. 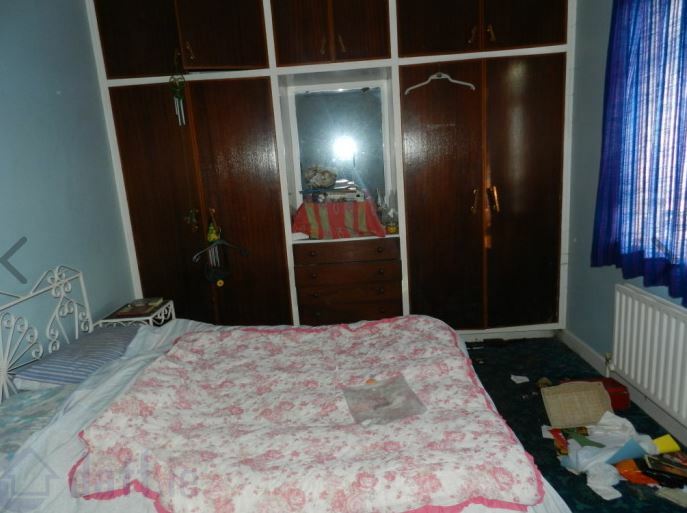 Why photograph the room in this state? 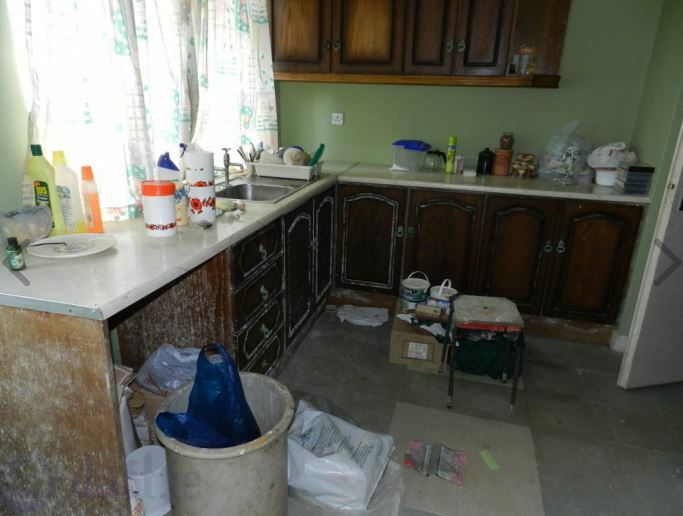 How untidy can you get? 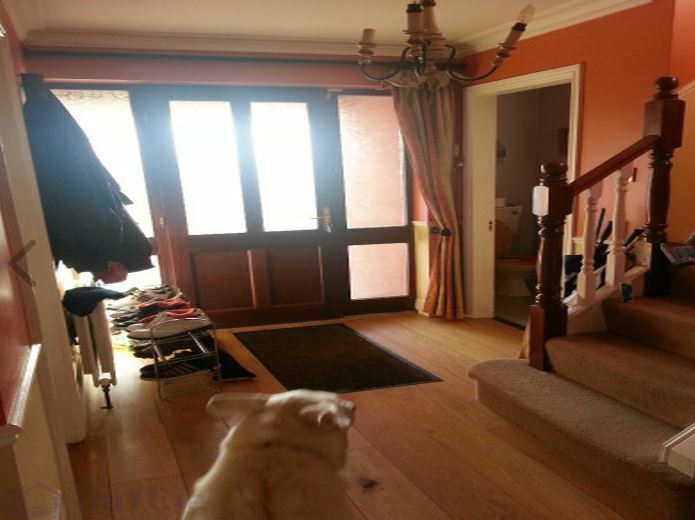 Property photography 101 – keep humans out of the pictures! 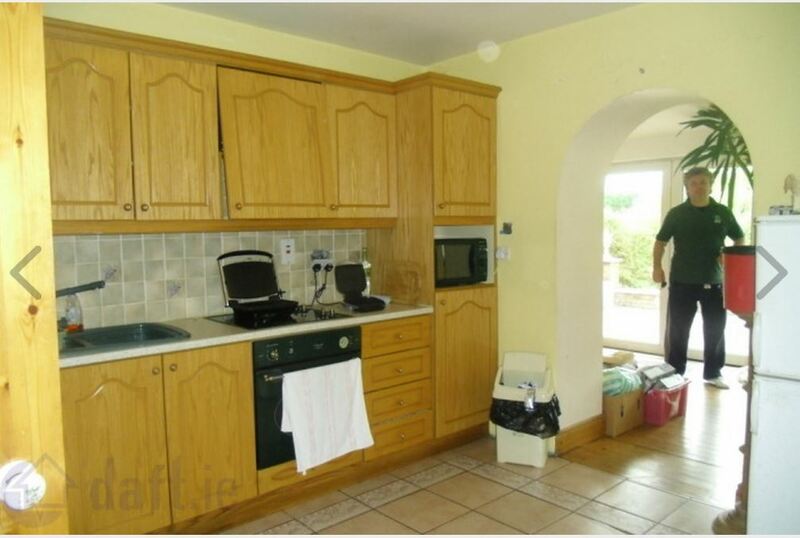 Check out the figure on the wall. Creepy! 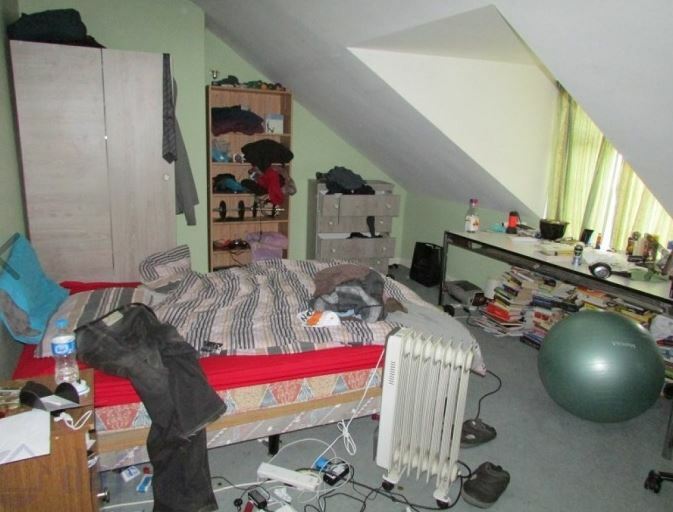 I can’t blame the photographer for not tidying this up. There’s a limit to what he/she can be expected to do. I have no idea what this is supposed to be. 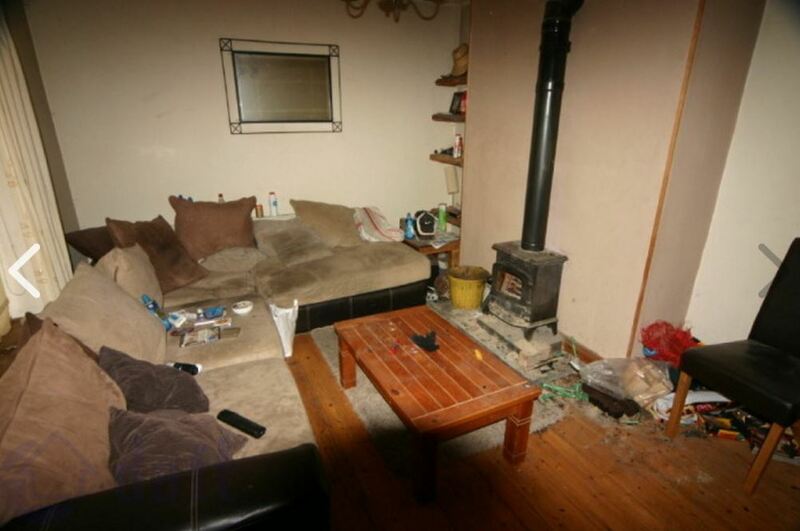 The conservatory with rubbish bags is not a good look. Another photographer who went for the impressionist look. It references Van Gogh’s “Chair” nicely, don’t you think? Badly lit and taken at a resolution totally unsuitable for uploading at this size. It may have looked OK (ish) on that cheap 2MP compact you bought 15 years ago but really, what *were* you thinking when you published this? Nice white van. 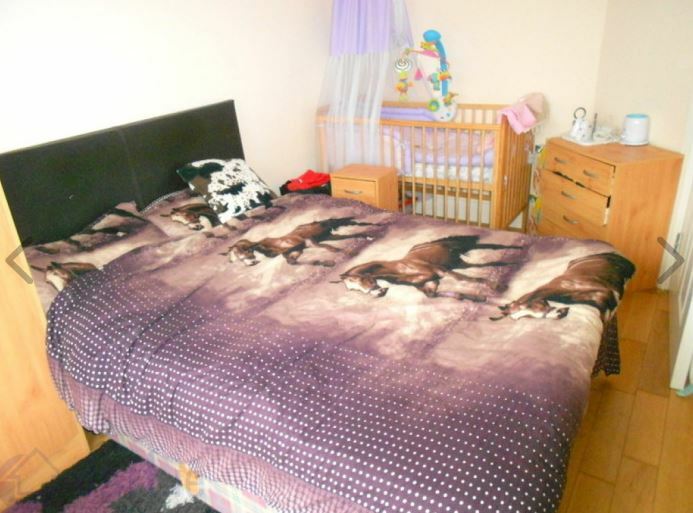 I presume though that you meant to show the room? Aimed at buyers with chronic myopia, perhaps? It will look just like this in reality to them. Ugh. Another tiny resolution image enlarged far beyond its limits. 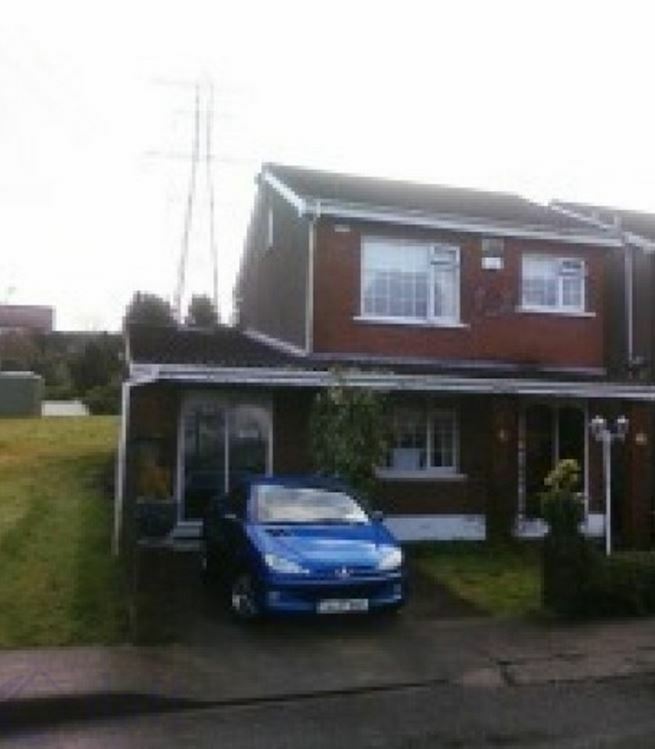 And having a vehicle in the drive is a big no-no – people are interested in buying the house, not the car. 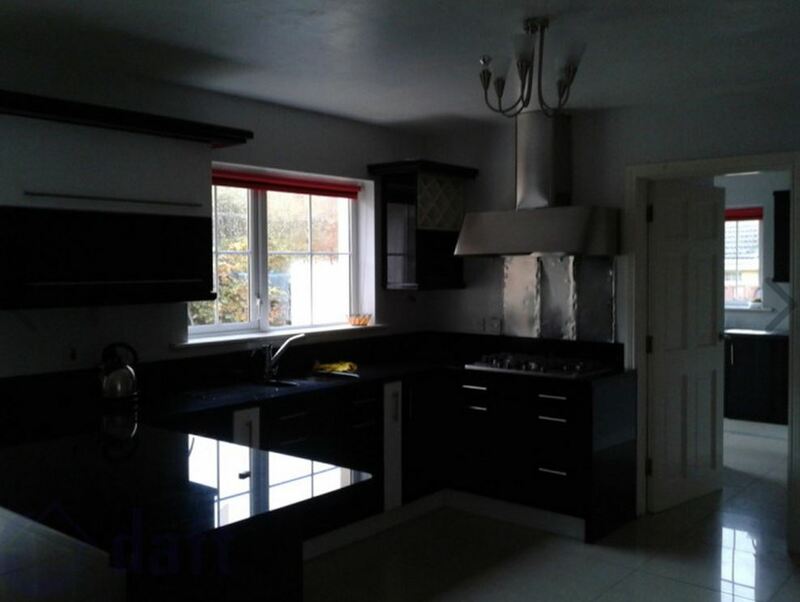 This might be a winner in a photo competition for dark, moody interiors. 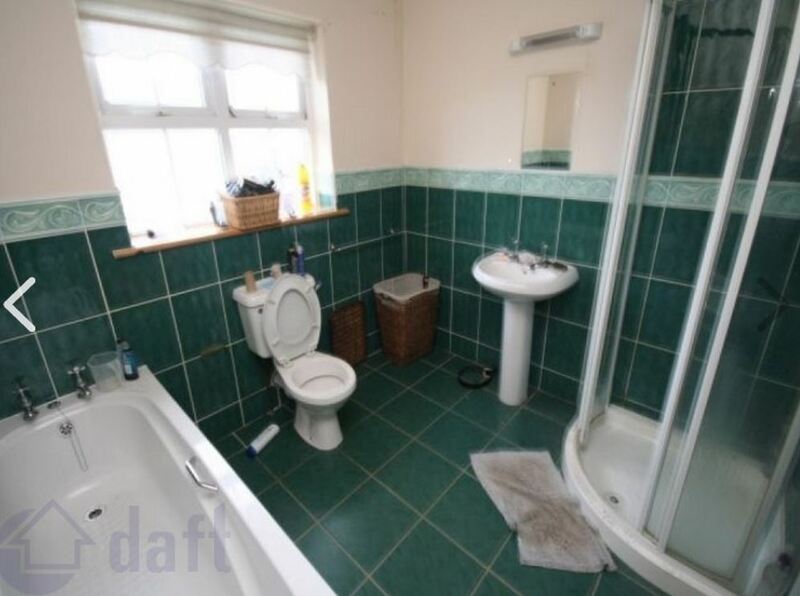 As a photo designed to sell a house it’s crap. Oh dear. 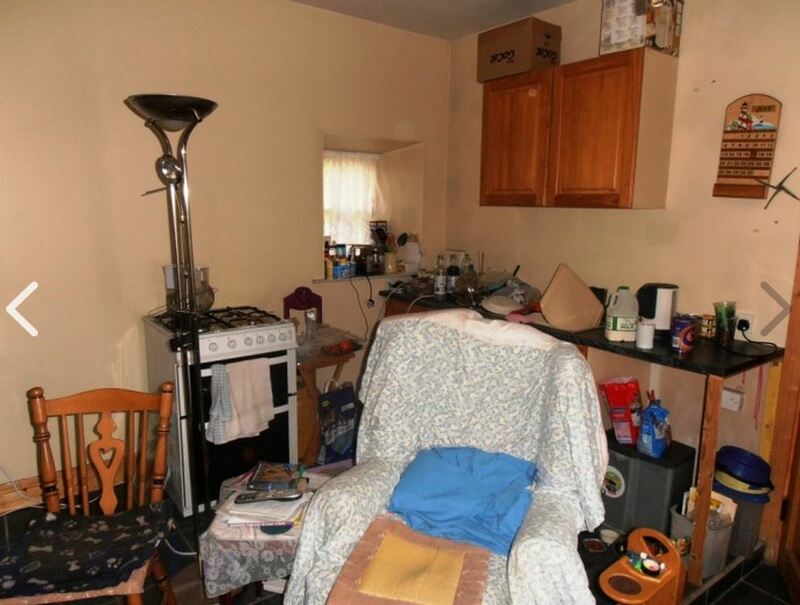 This will never feature in The House Beautiful magazine. 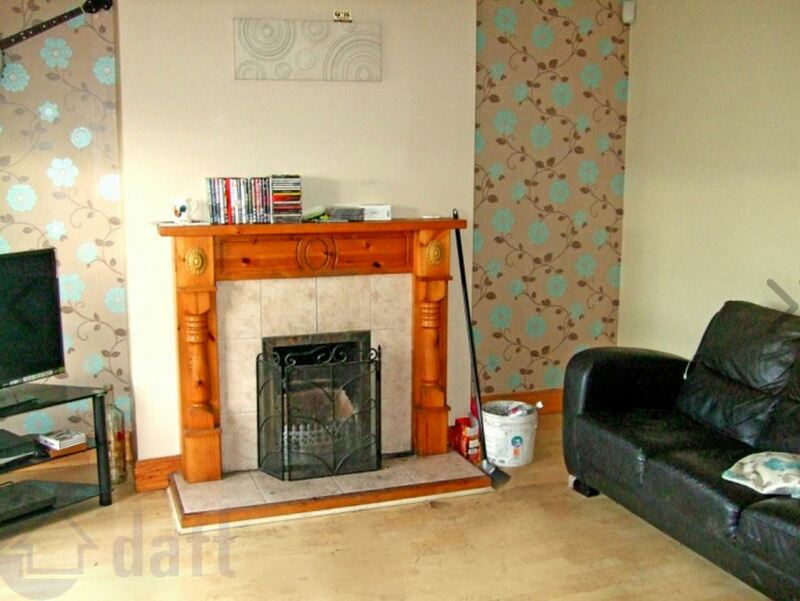 If the owner/renter couldn’t be arsed to tidy the place up before you arrived get him/her to do it before you take a photo. Or, tidy the damn place yourself. Don’t show this kind of thing to the nation. Did you even stop to think that maybe, just maybe, the inclusion of the ironing board might not have been the best compositional idea? 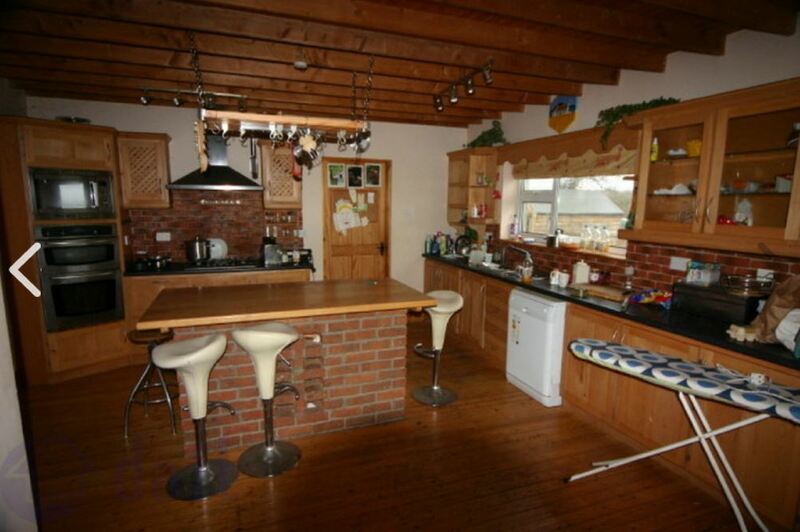 Re-positioning the stools should also have been a no-brainer. Pity too about the dark spot in the foreground which the built-in flash couldn’t illuminate. 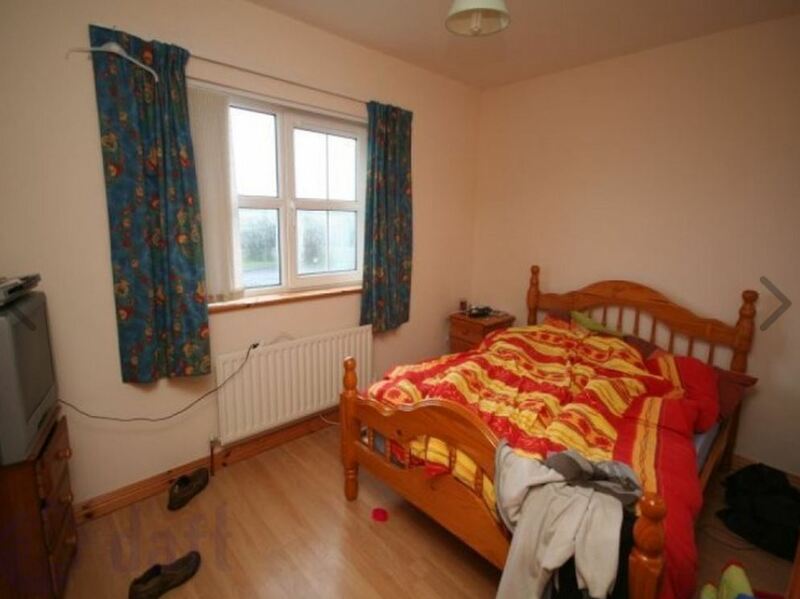 The unmade-bed-and-untidy-room is not a good look. 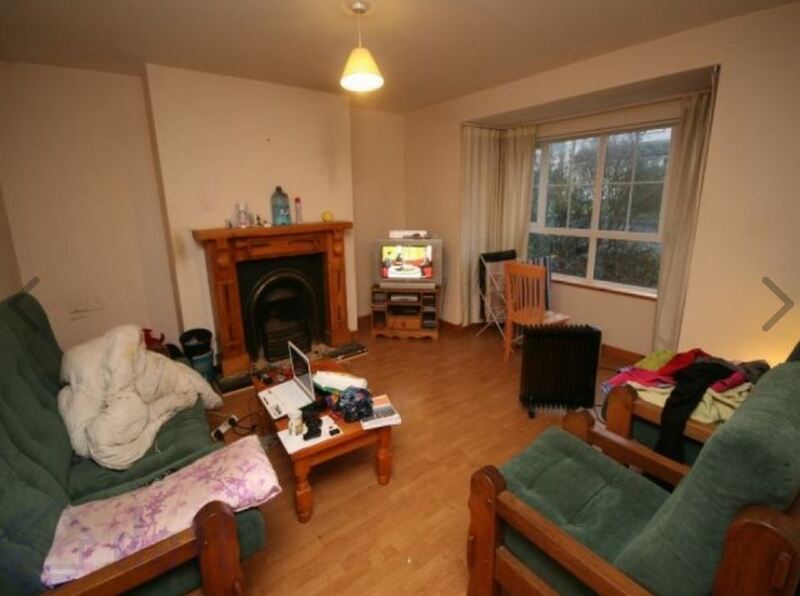 The occupiers clearly didn’t give a damn about how the place looked. 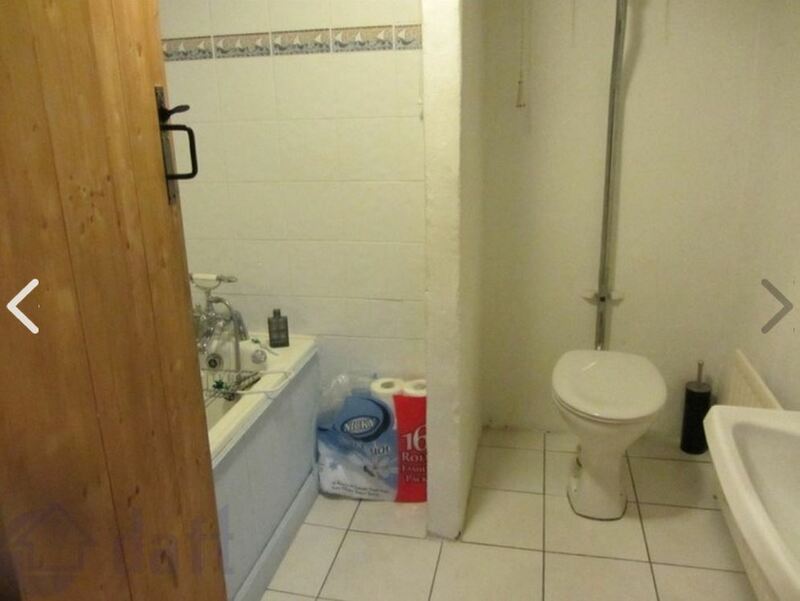 Your job is to make it look somehow half-decent for the camera. Did you not have your rubber gloves with you to pick up the dirty towel? An essential item in any property photographer’s arsenal. 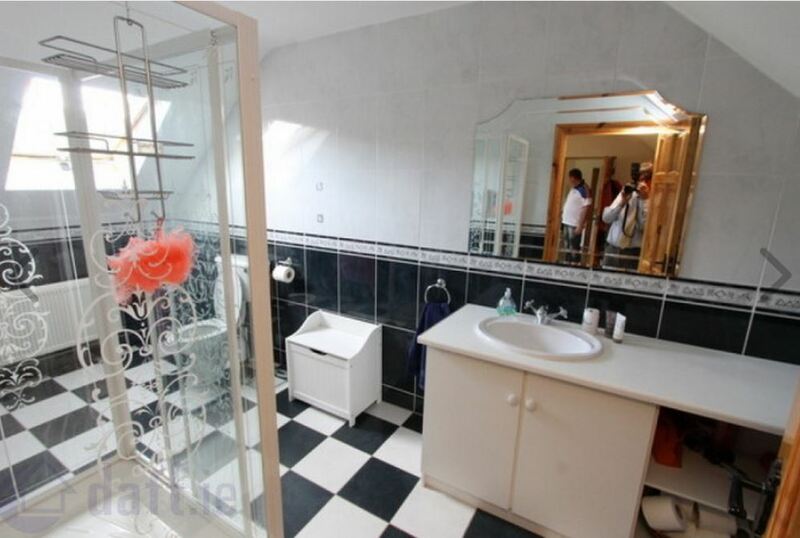 There’s a lot more wrong with this shot but the towel grabs our attention. 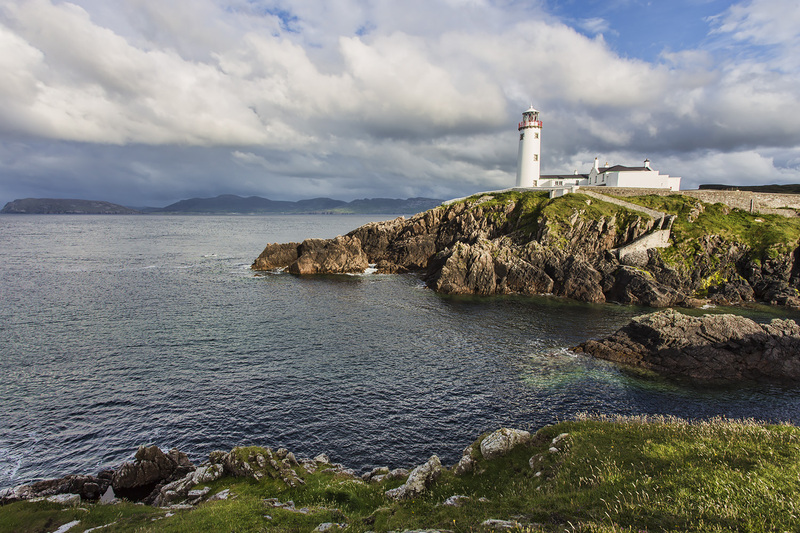 Ireland’s answer to the Leaning Tower of Pisa? 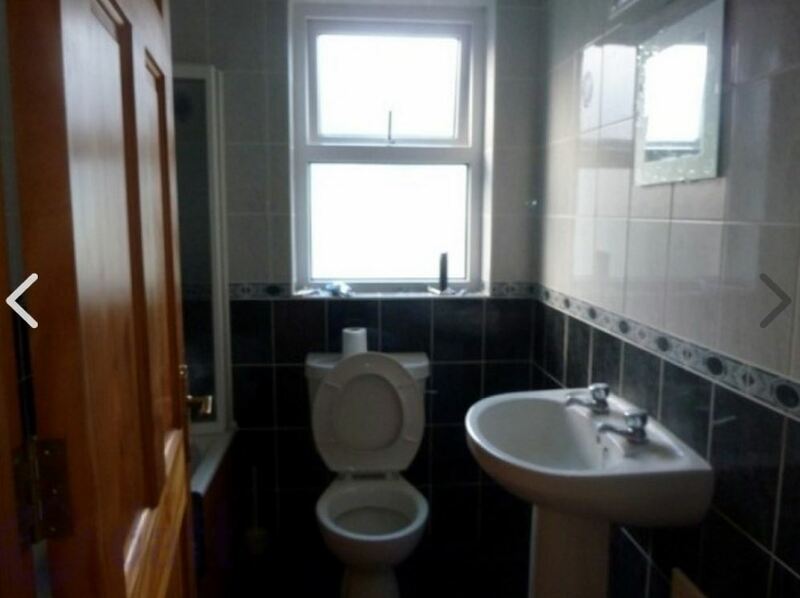 Poorly lit and the toilet seats in property photos should *never* be up. 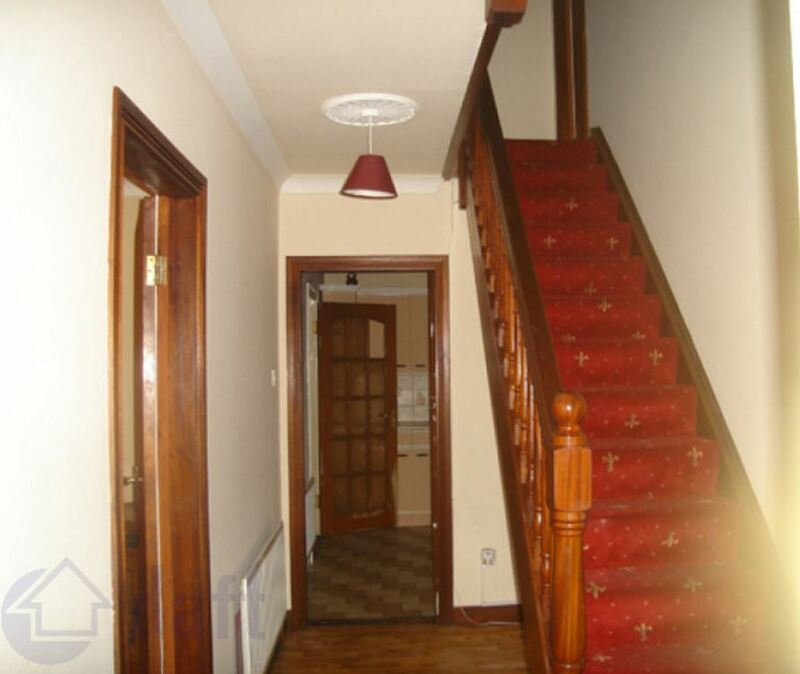 This property should be of interest to those keen to investigate psychic phenomena – that bright spot on the lower right may be evidence of an apparition. Ah, look – Compo and Nora Batty on the telly! 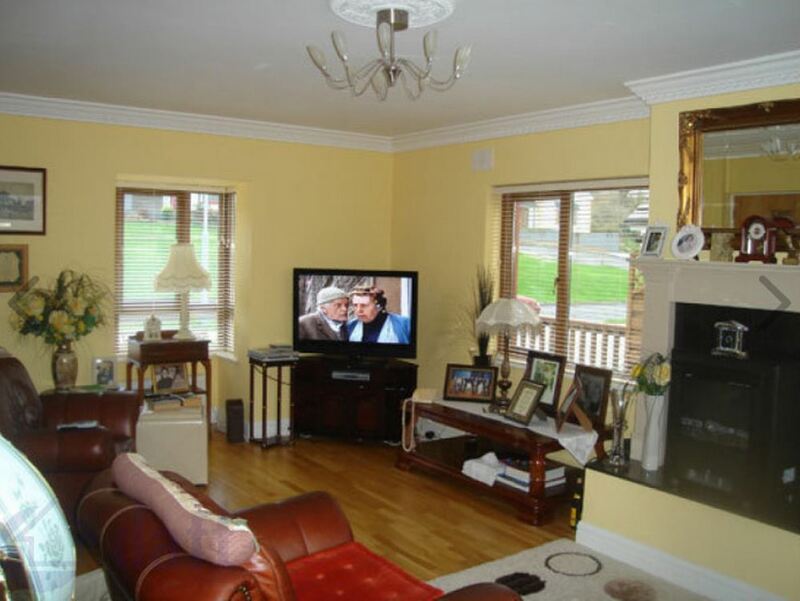 Tip: switch off TVs when photographing rooms. Cast A Giant Shadow was a good 1966 film starring Kirk Douglas and Senta Berger. This is a bad photograph. Not a bad self-portrait, dude. 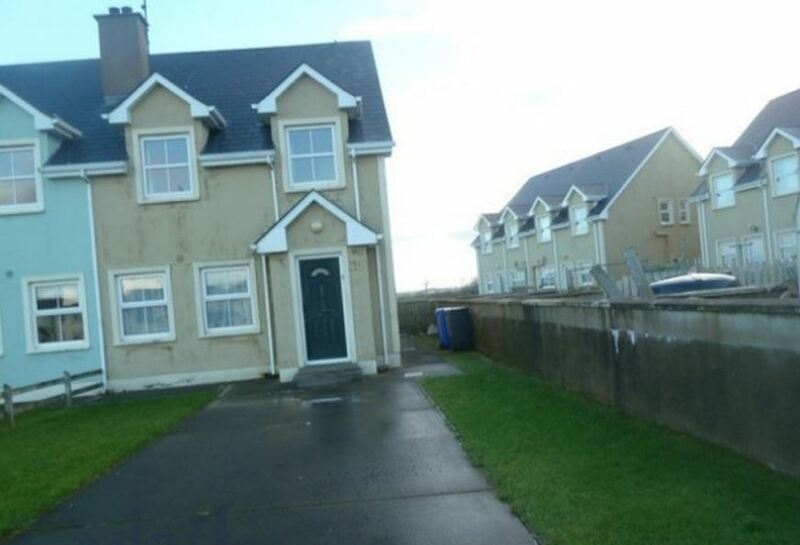 What’s it doing on a property website? 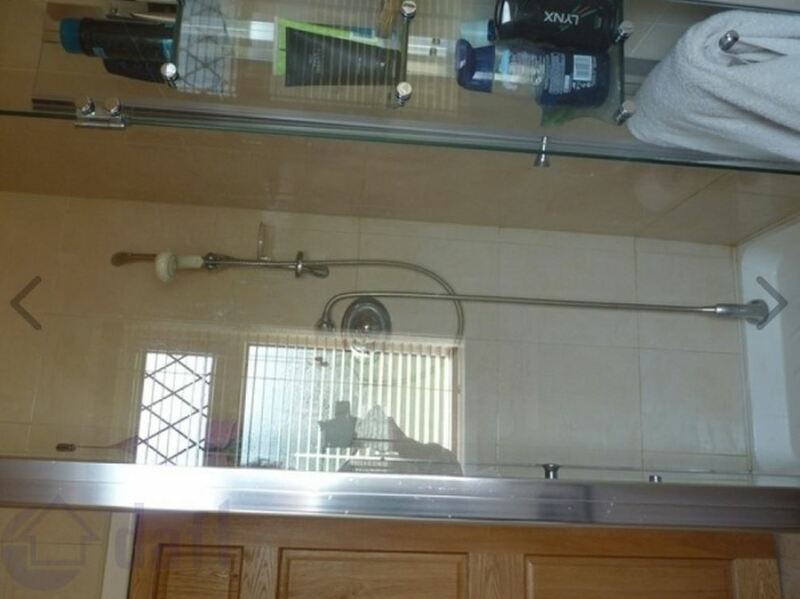 Shower units are usually presented in the vertical position. And is that a reflection of your hand holding the camera? This might have been a contender were it not for the lack of sharp focus, the uneven lighting and the blue car outside the window. 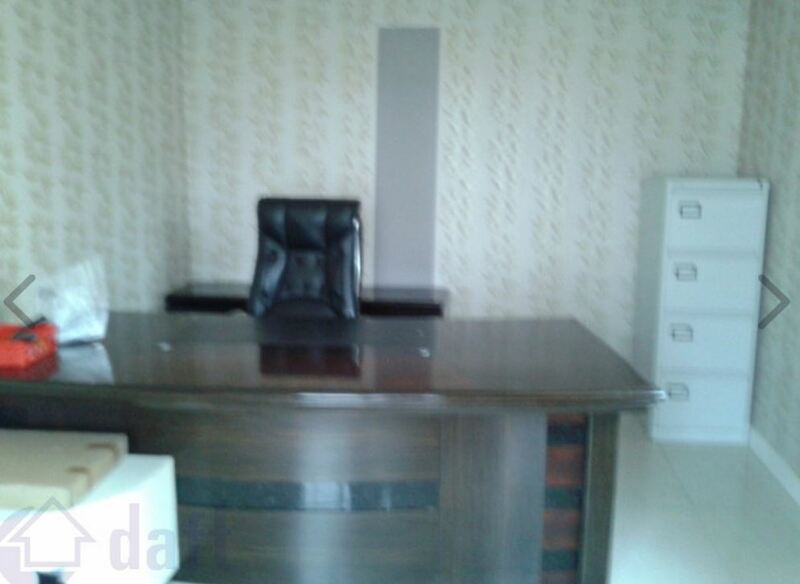 From the black-hole-of-Calcutta school of property photography. Ain’t never going to be a success. 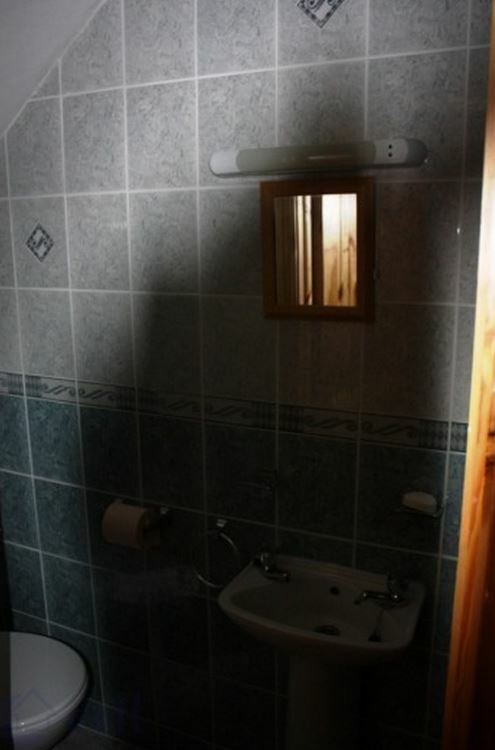 I presume you inadvertently clicked the shutter while looking at something else. There can be not other explanation. But why post it? 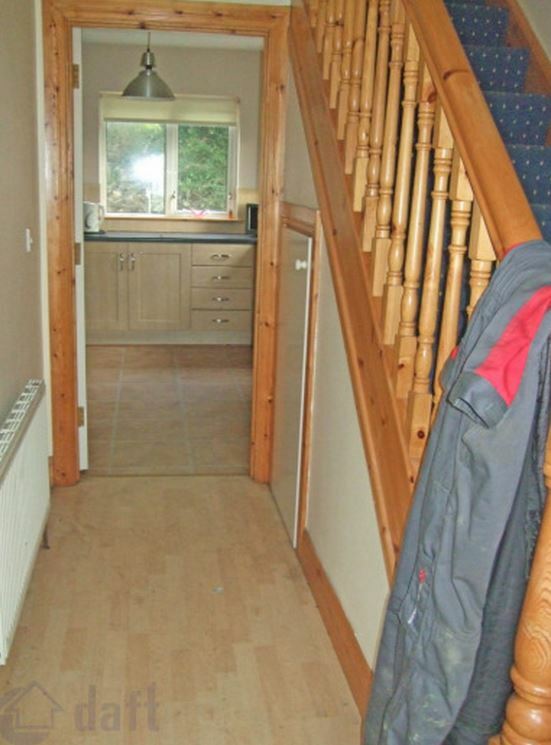 Would it have killed you to remove the clothes from the banisters before taking the photo? 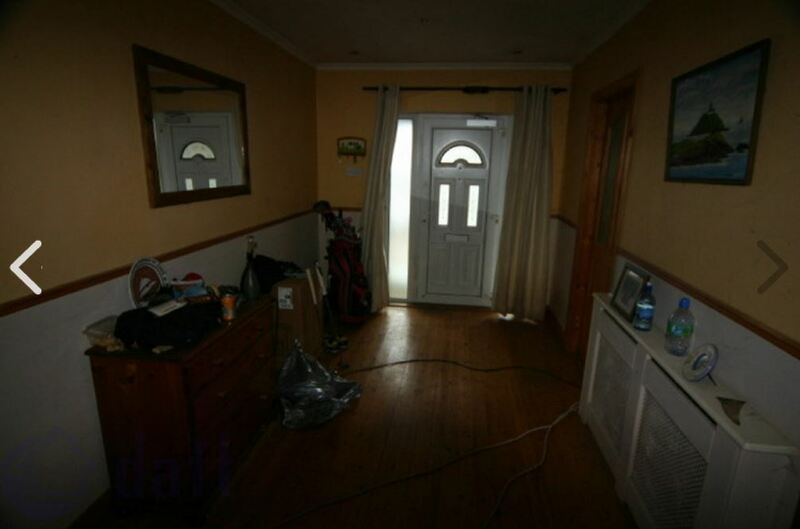 Not a great photo but it would have been significantly improved had you removed the bucket and brush. 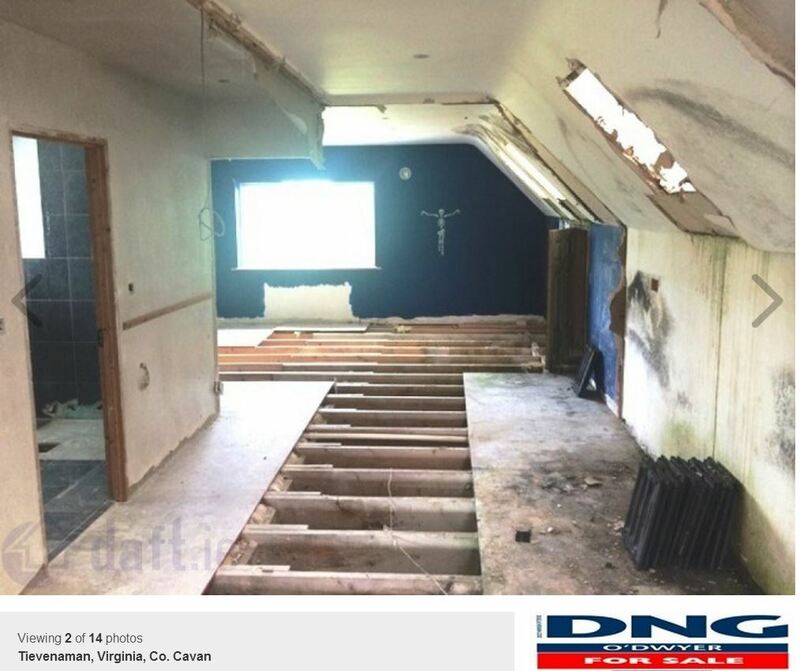 Sadly, these kind of photos are not uncommon on property websites. Apparently there’s a lot worse out there. 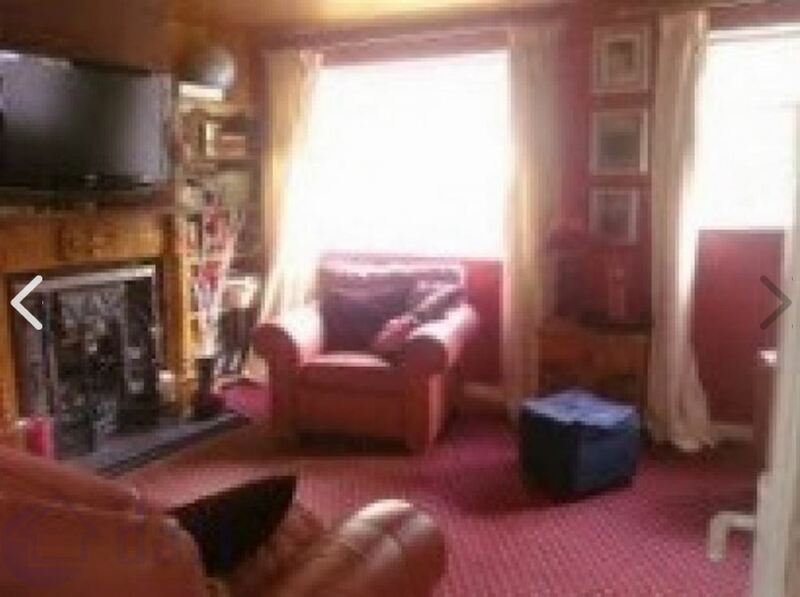 A Twitter contact of mine says he saw a photo of a room with a guy sitting watching telly! I would love to see such examples so if you come across any please drop me a line: carrigman@gmail.com.